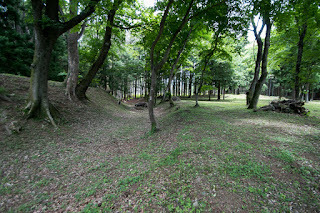 Nakanouchi castle (中之内城 , also called as Maekawa-Motoshiro castle or 前川本城) is built over the tip of peninsular like plateau of 30 meter height between Tachino-gawa river and Mae-kawa river, at the southeast of Yamagata Jidoshado Expressway Kawasaki interchange. 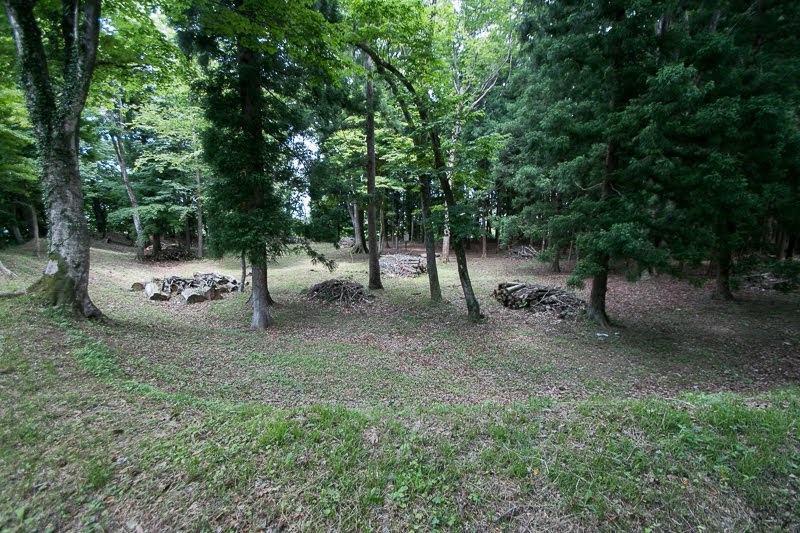 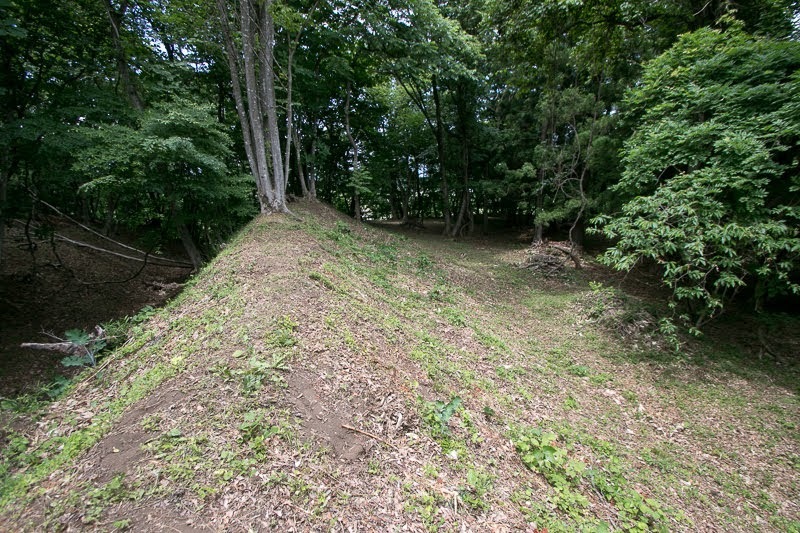 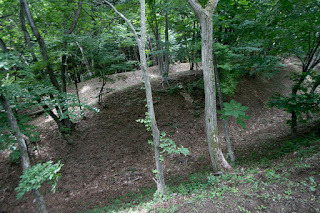 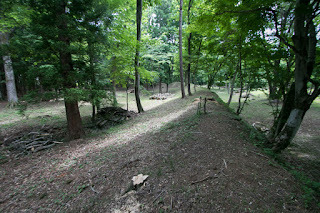 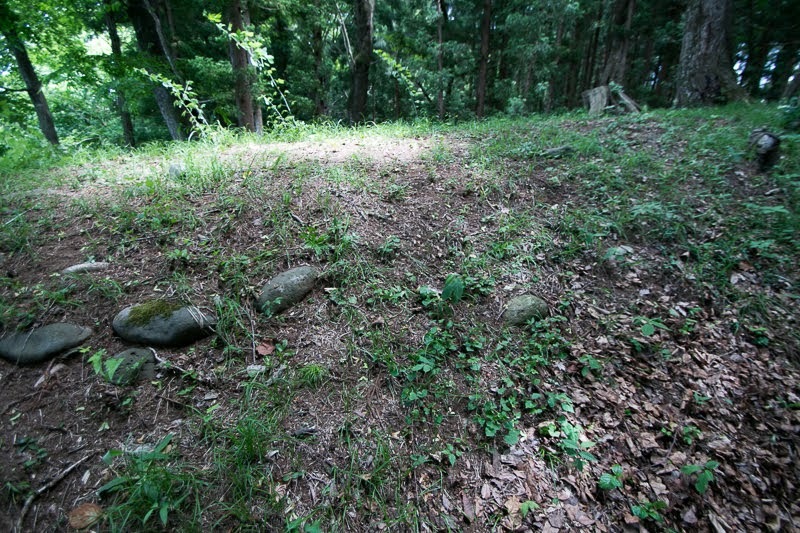 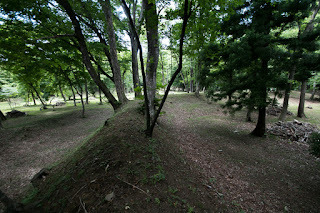 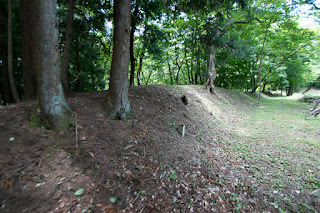 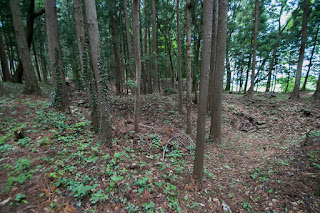 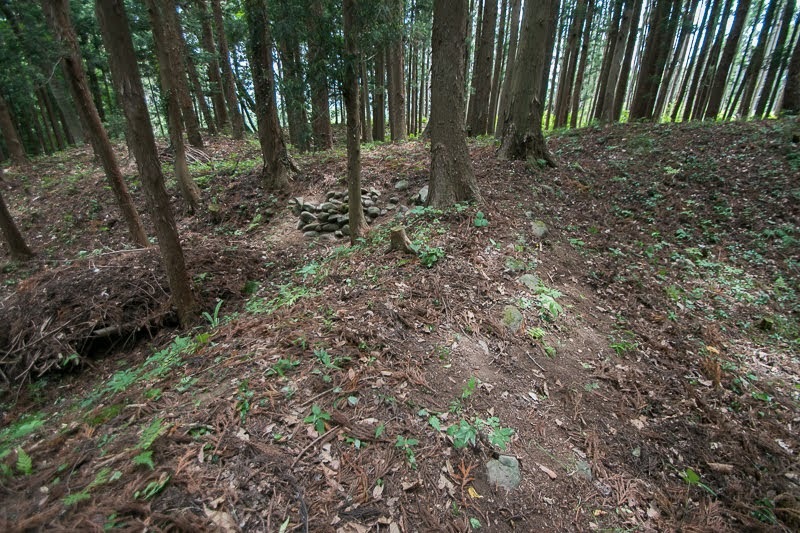 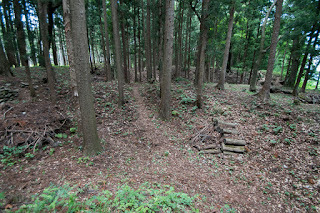 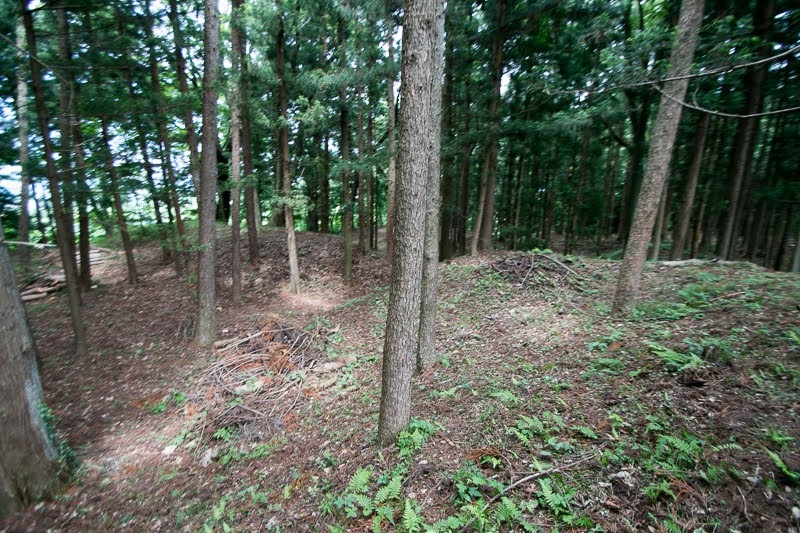 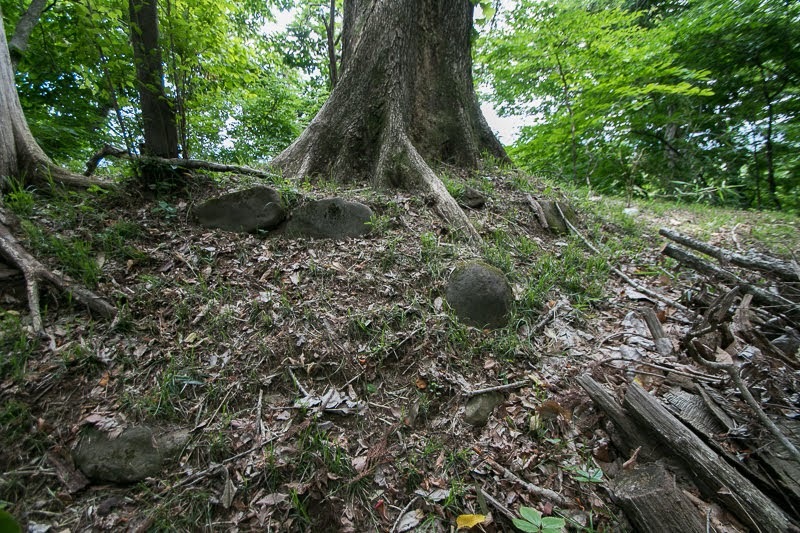 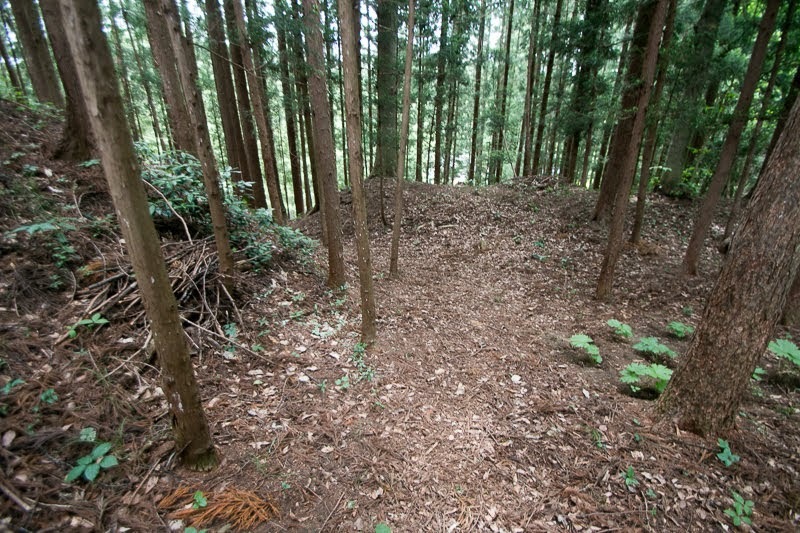 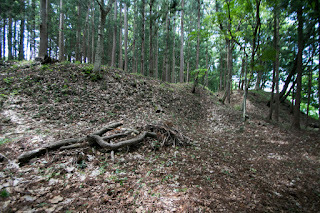 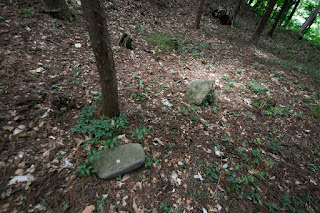 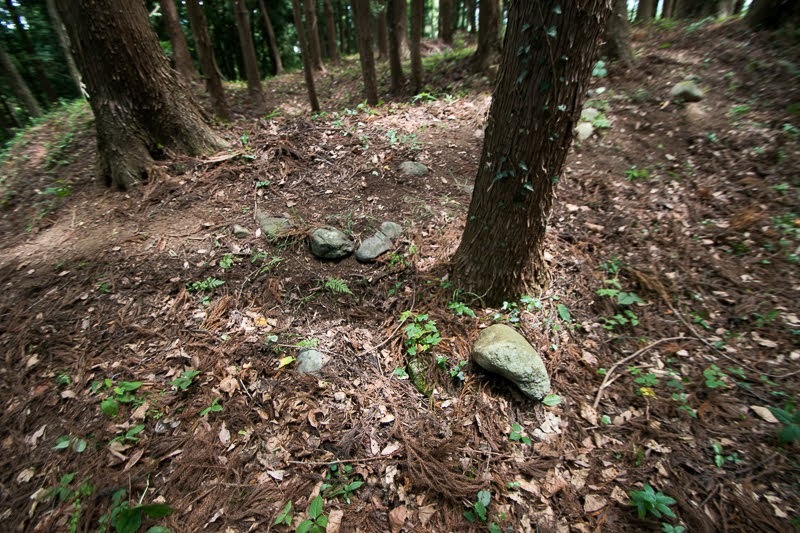 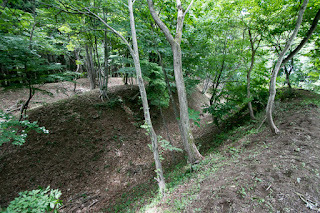 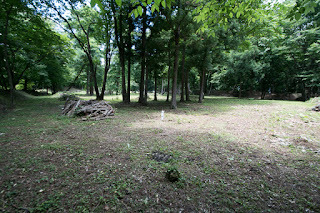 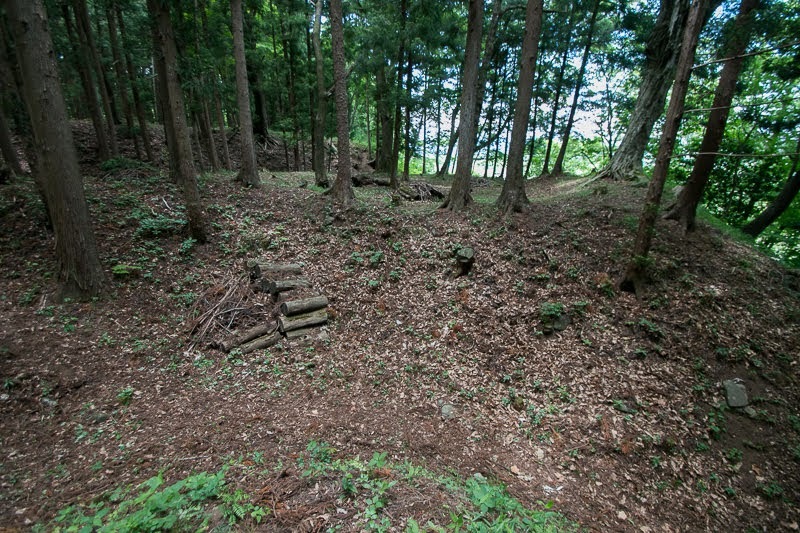 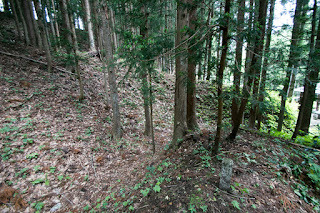 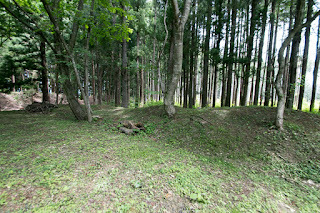 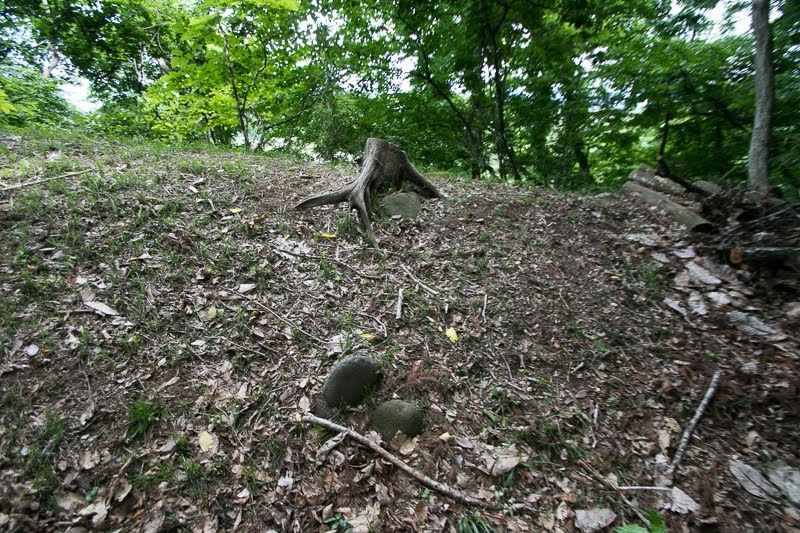 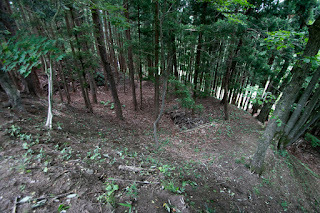 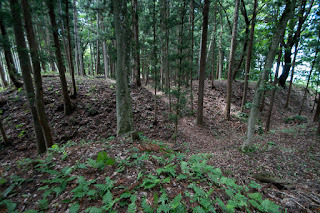 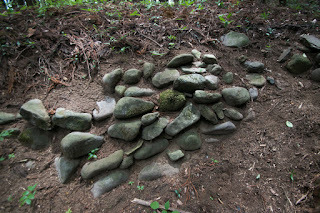 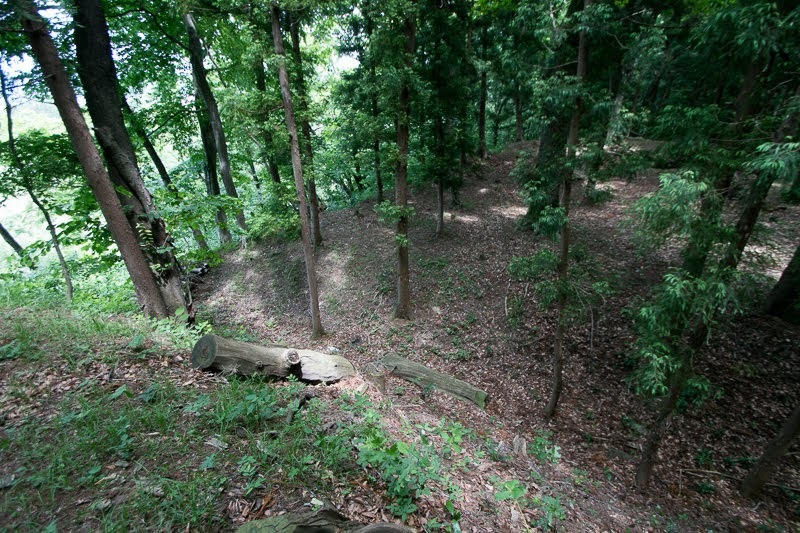 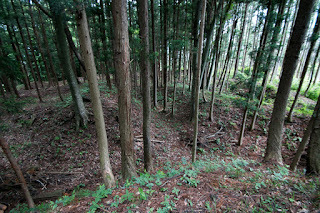 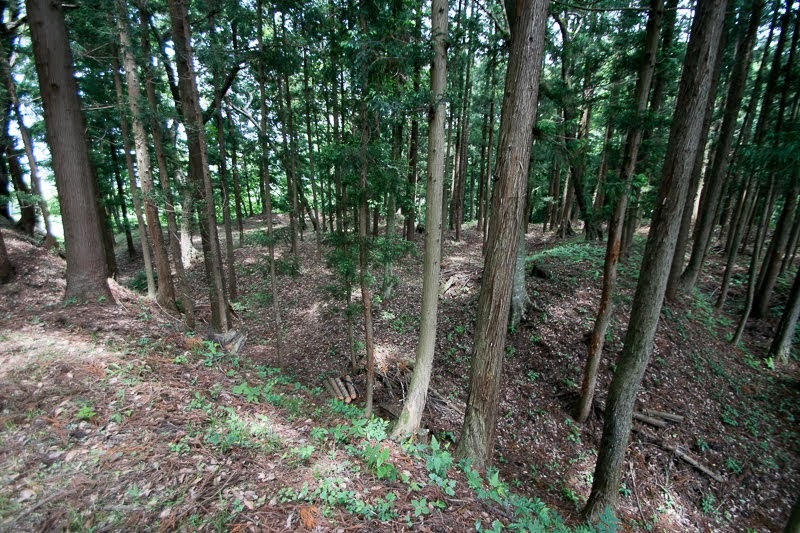 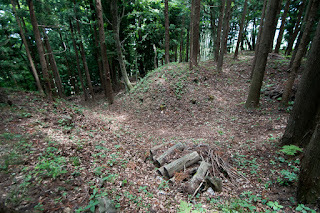 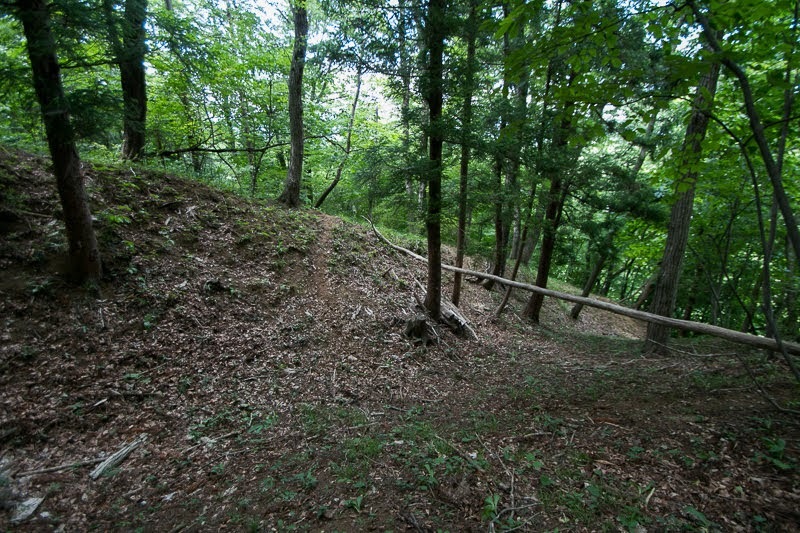 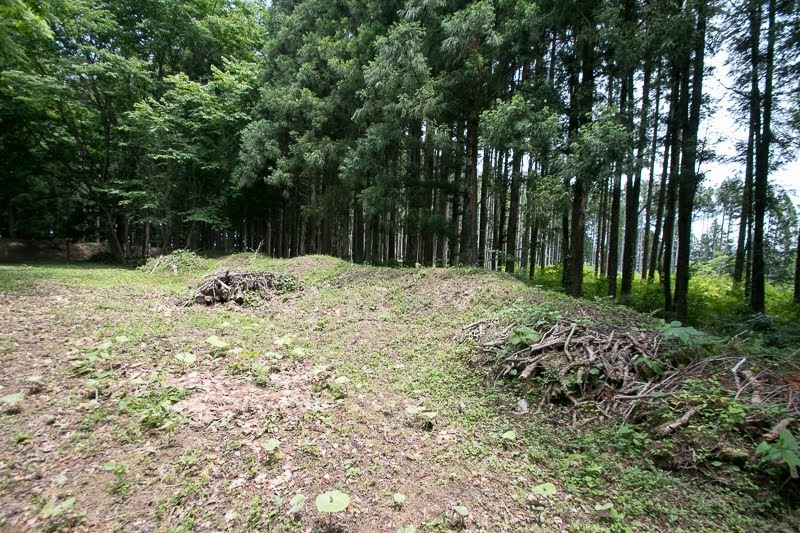 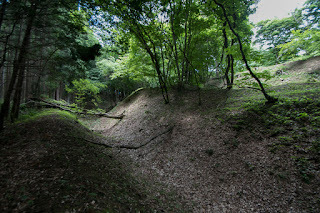 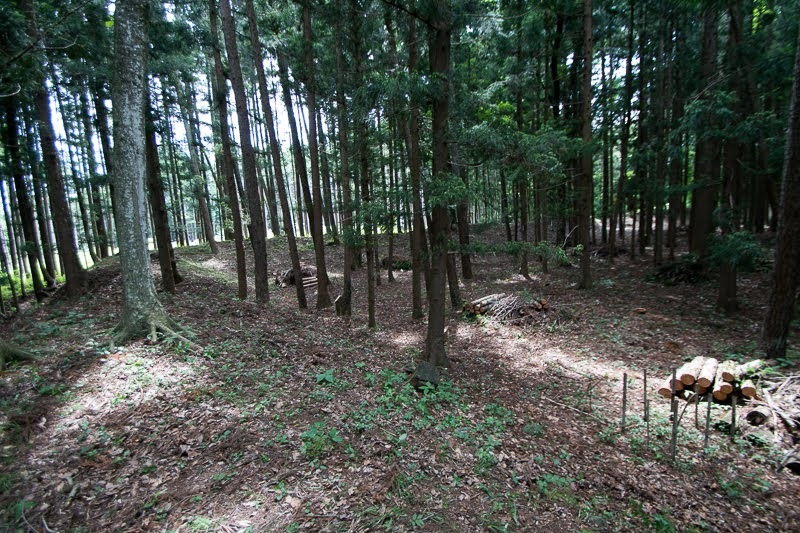 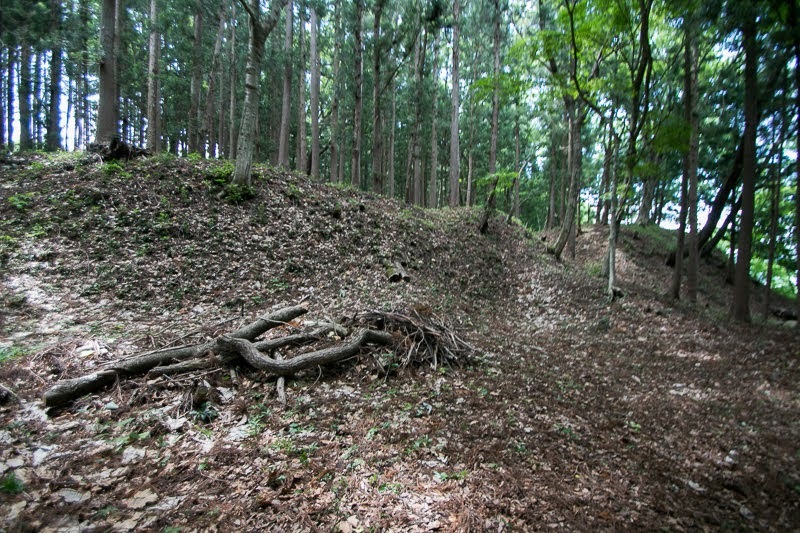 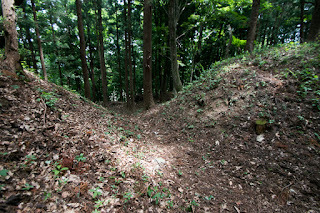 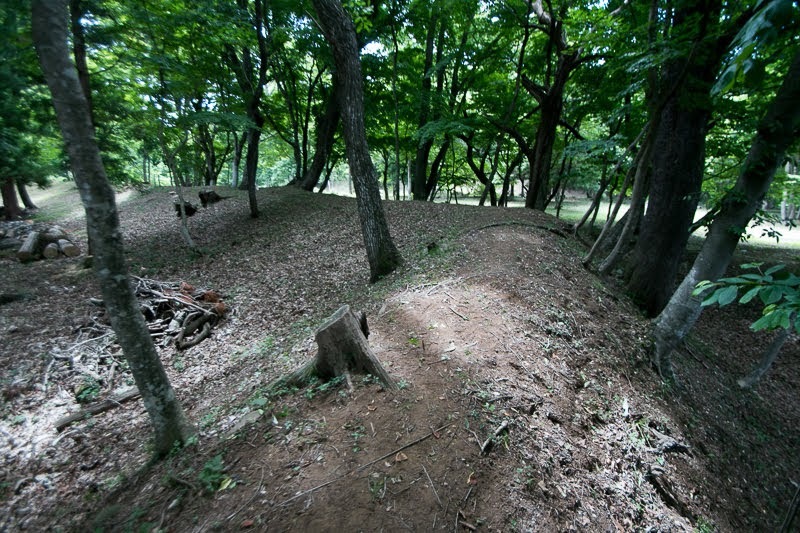 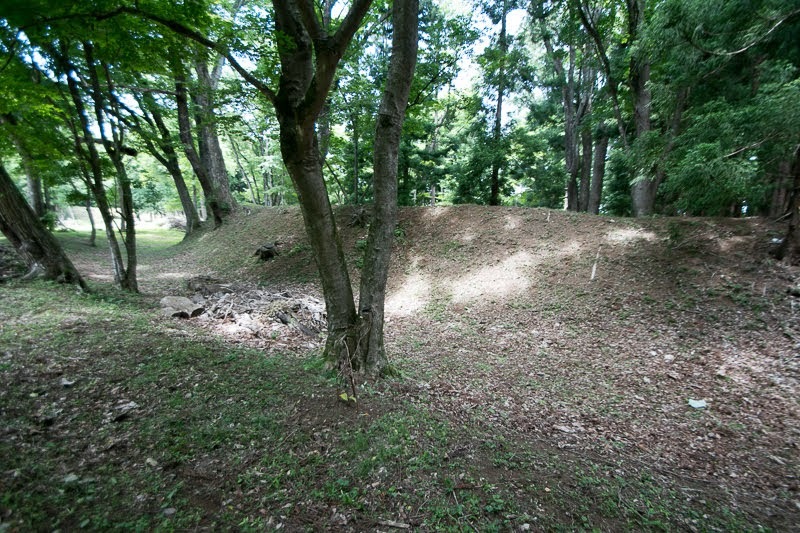 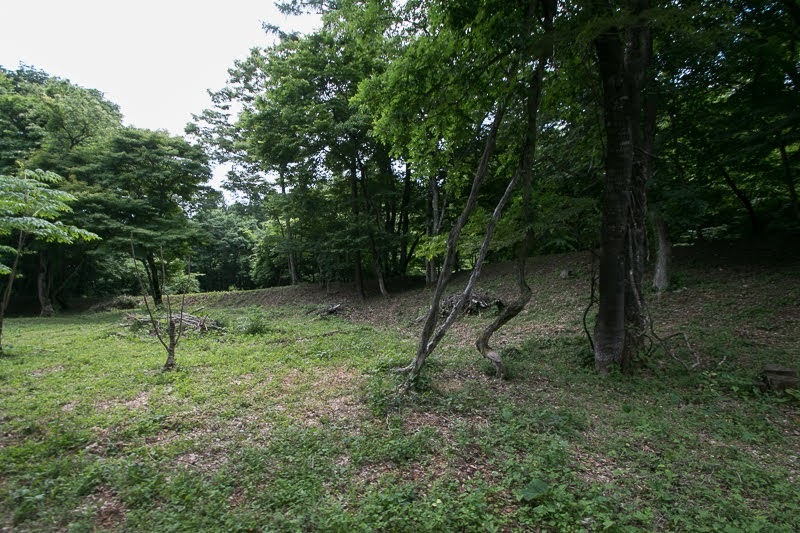 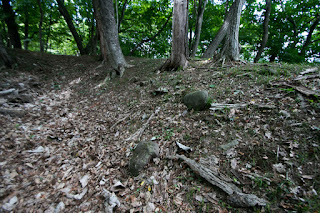 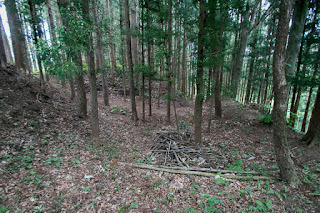 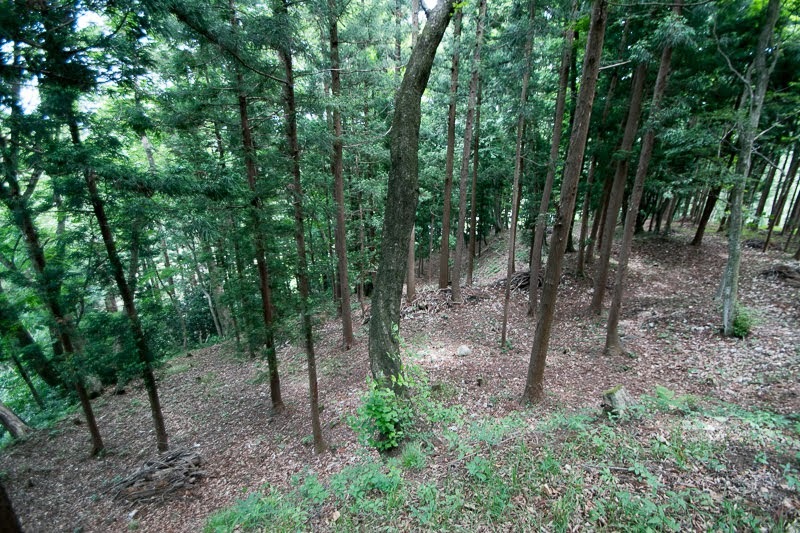 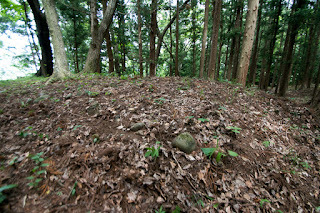 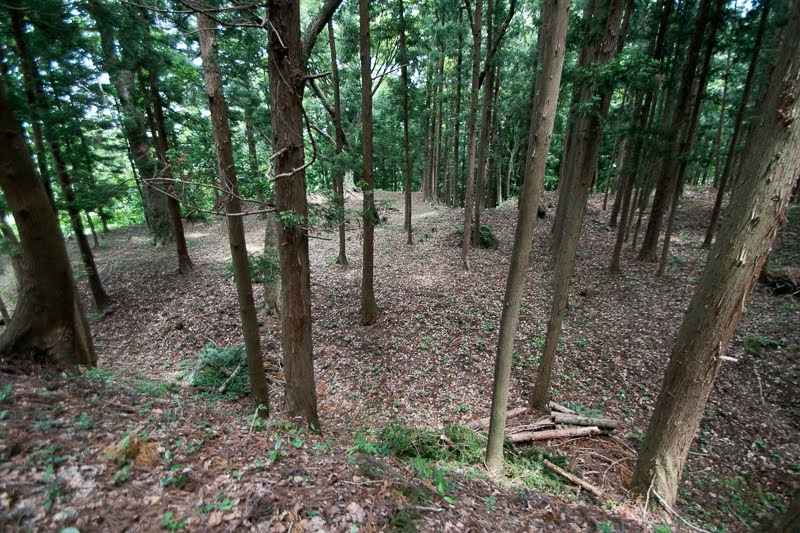 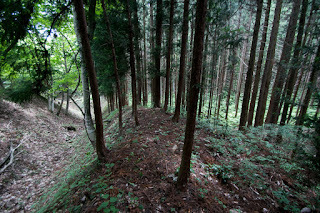 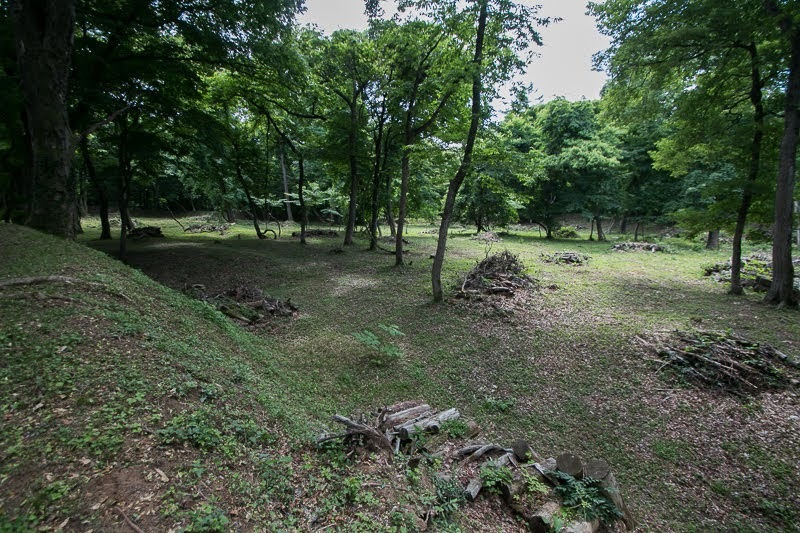 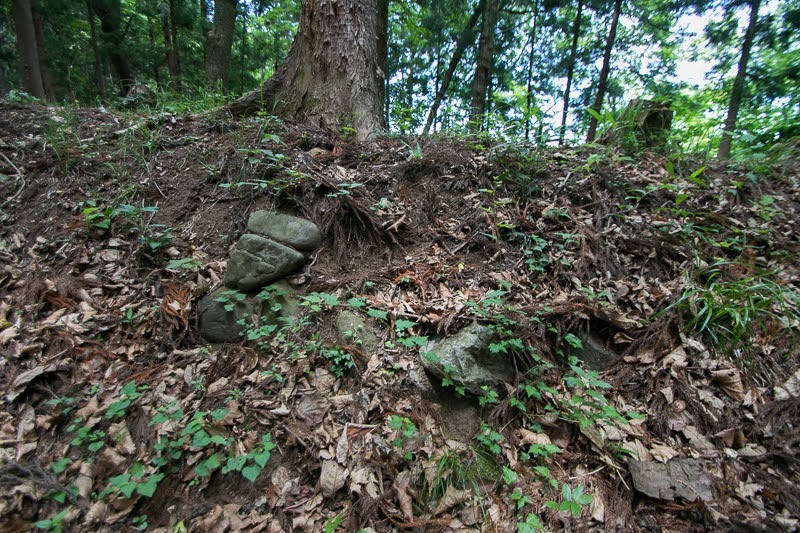 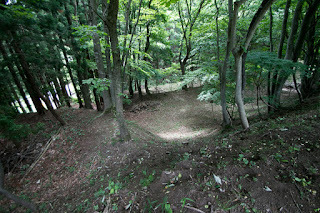 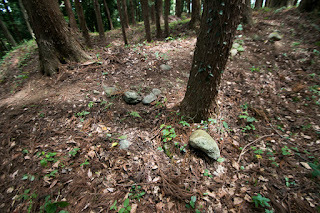 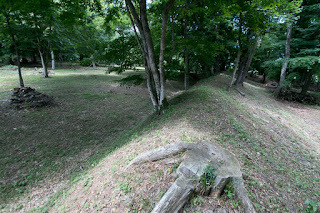 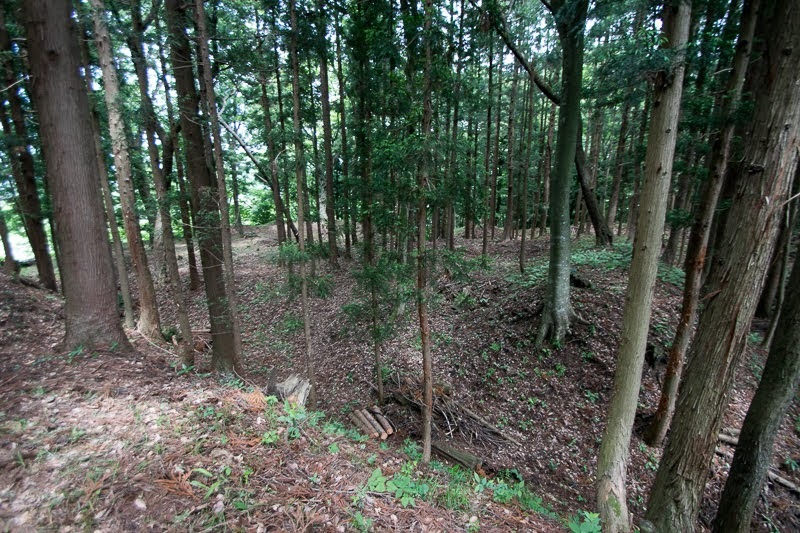 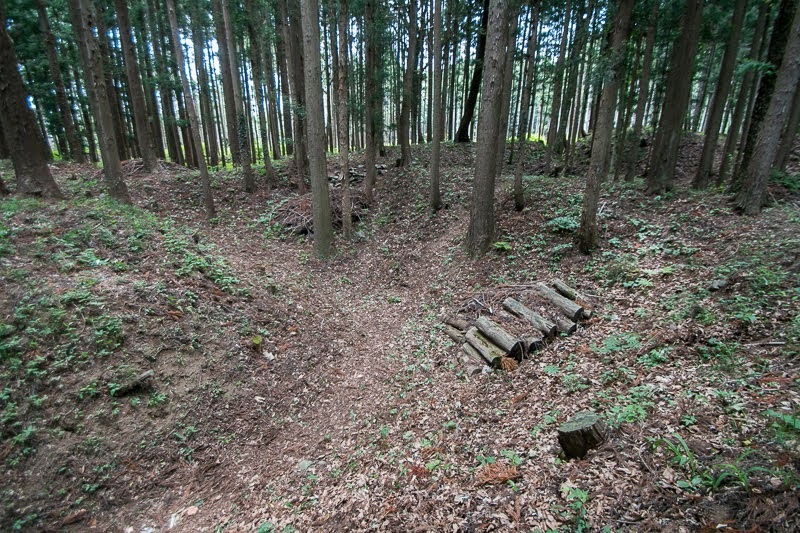 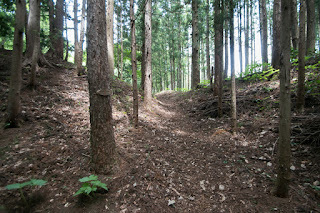 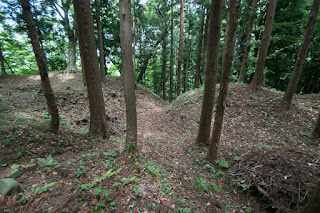 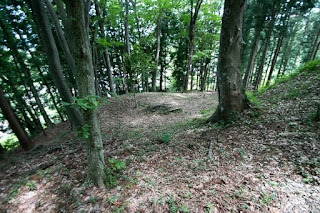 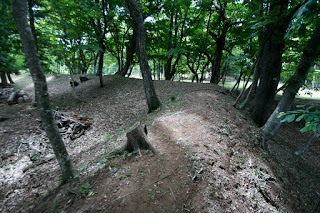 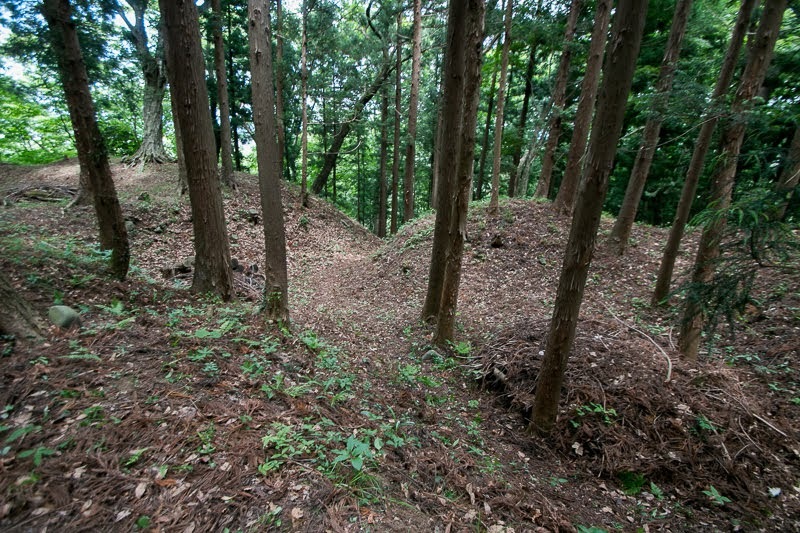 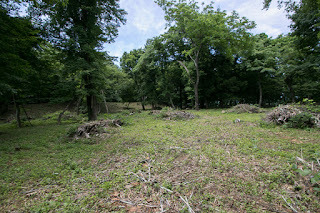 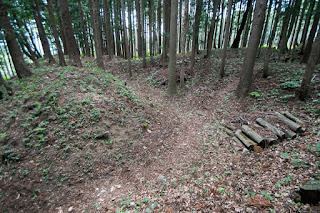 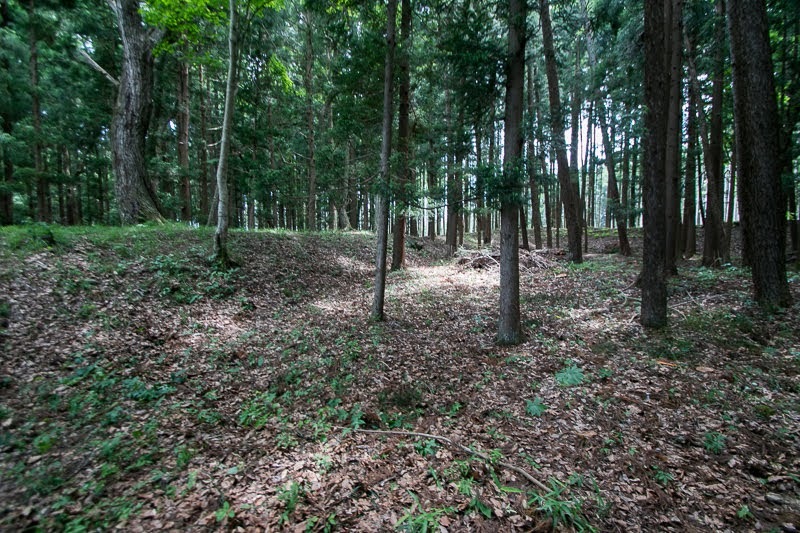 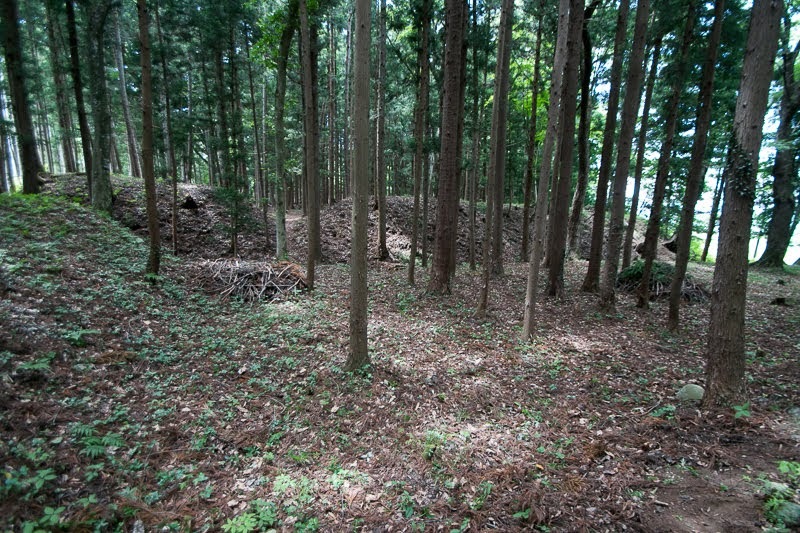 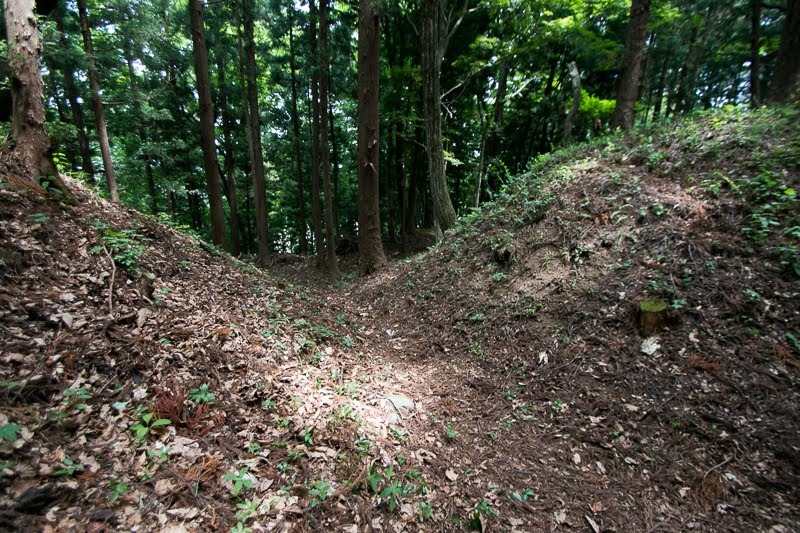 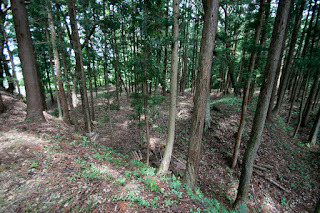 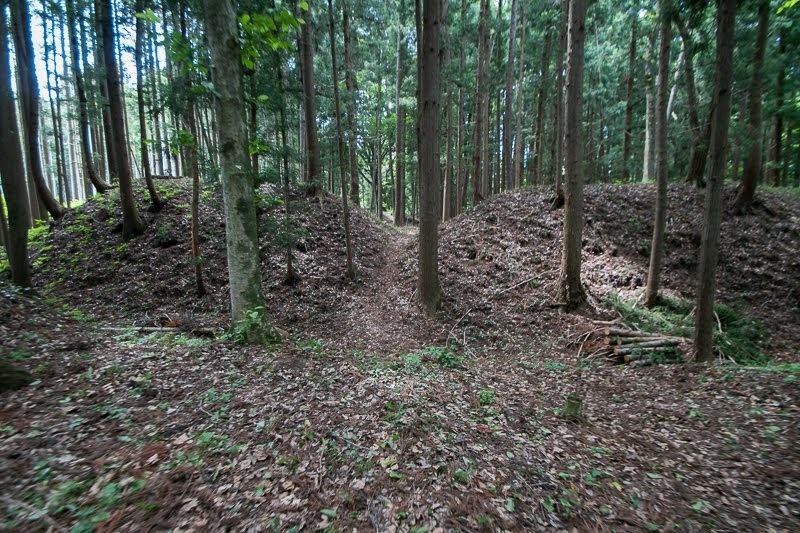 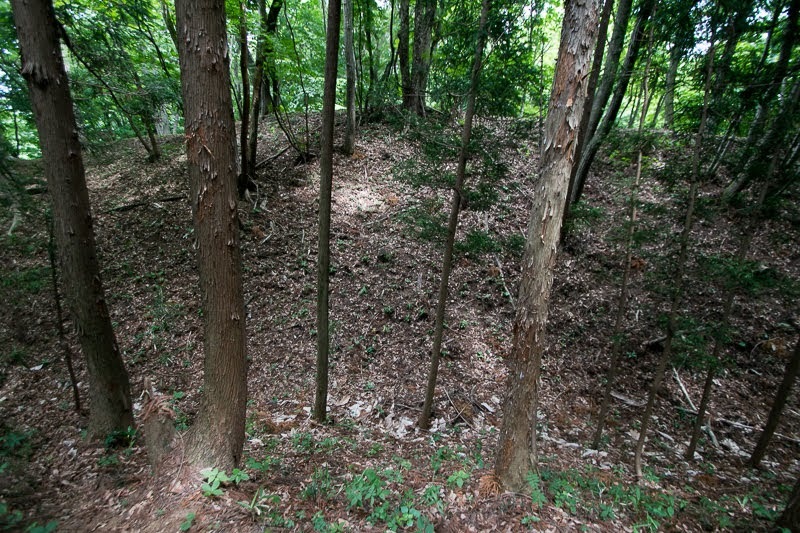 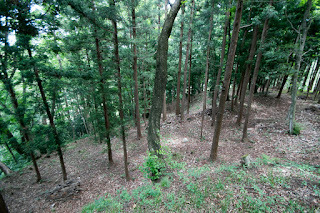 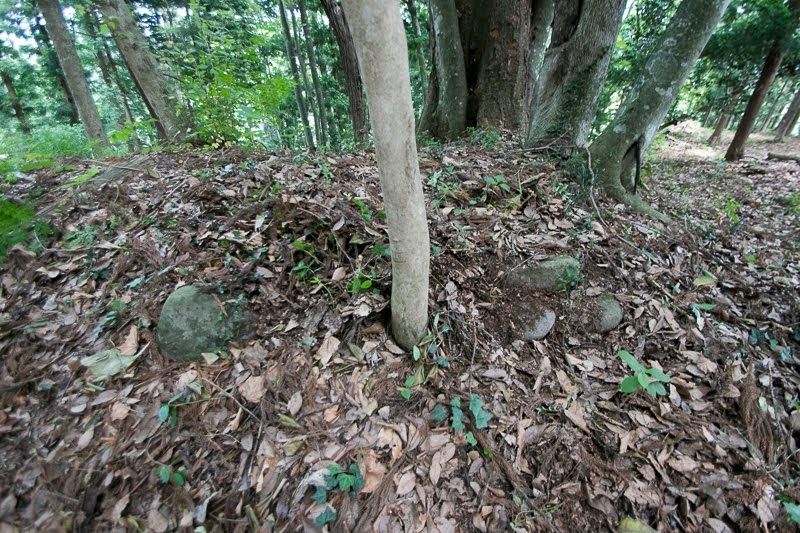 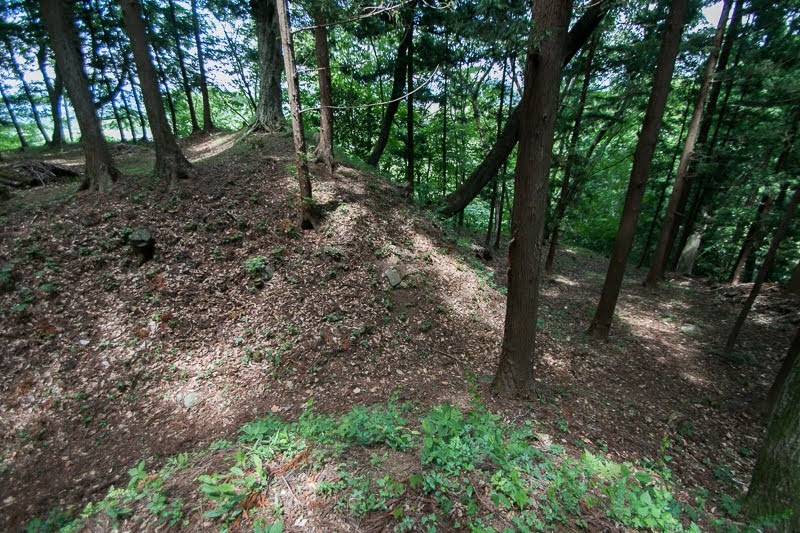 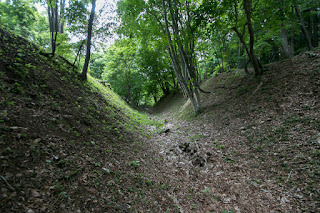 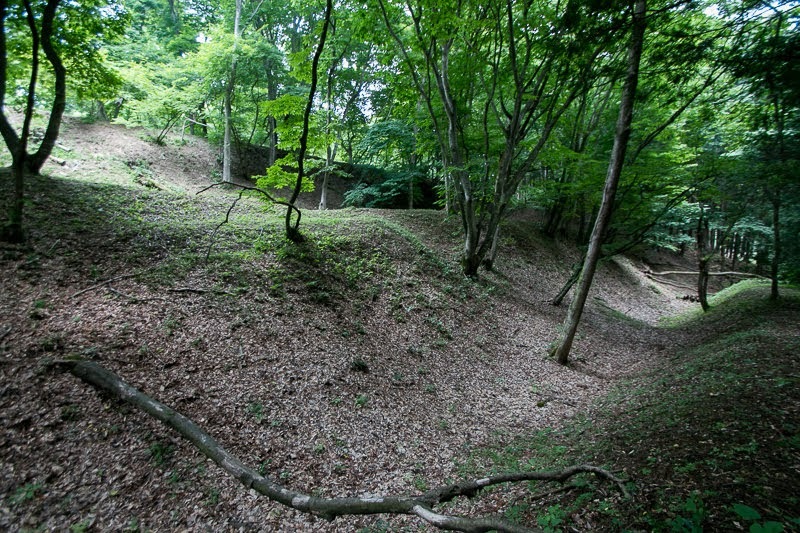 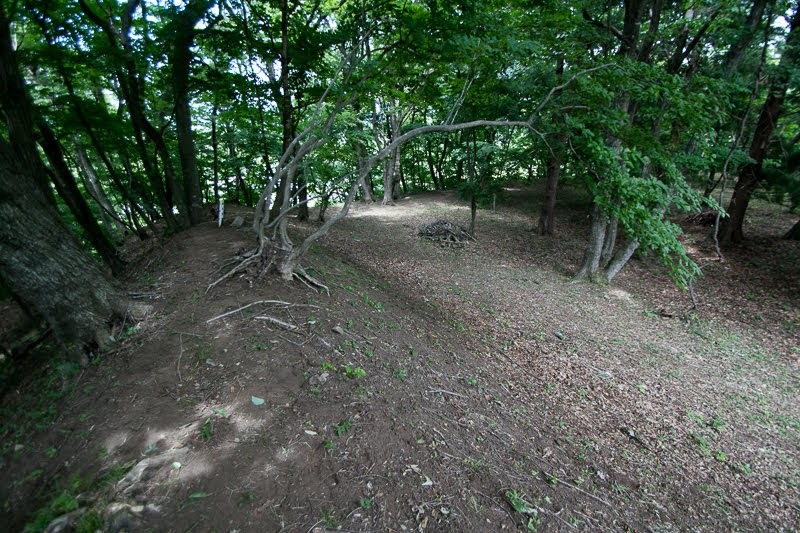 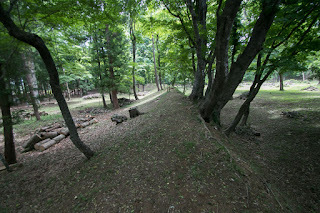 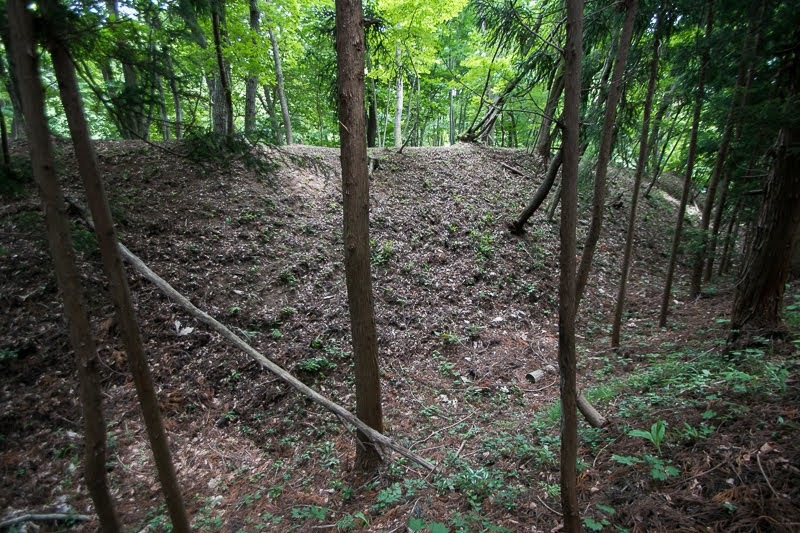 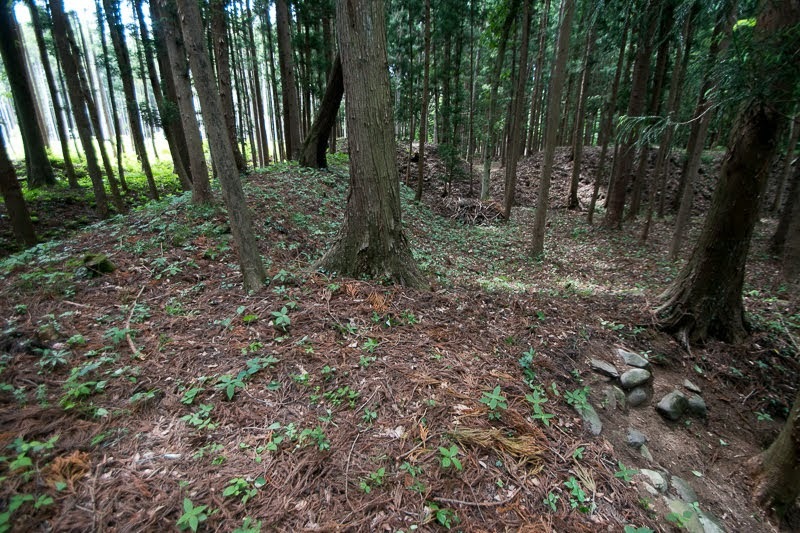 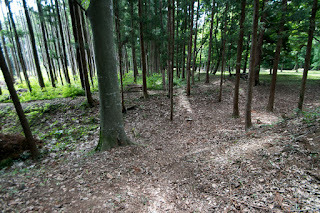 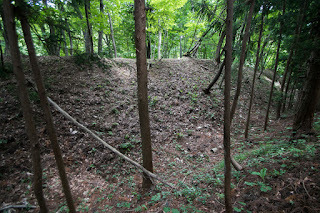 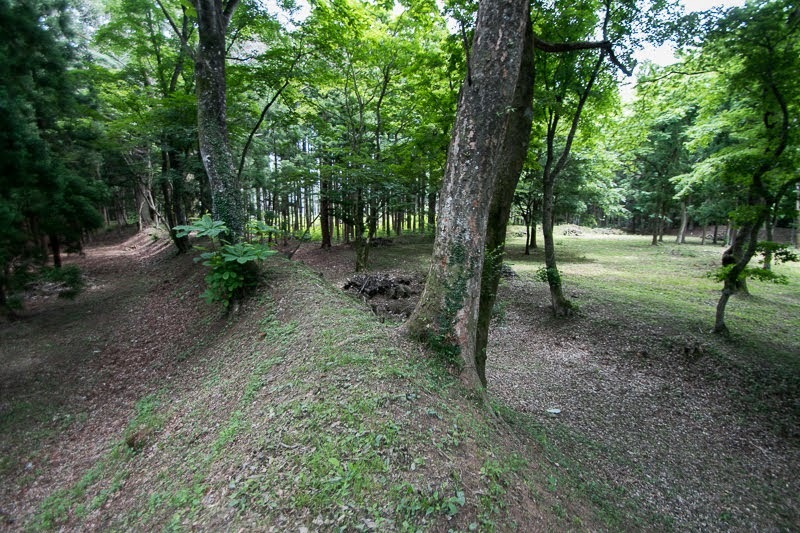 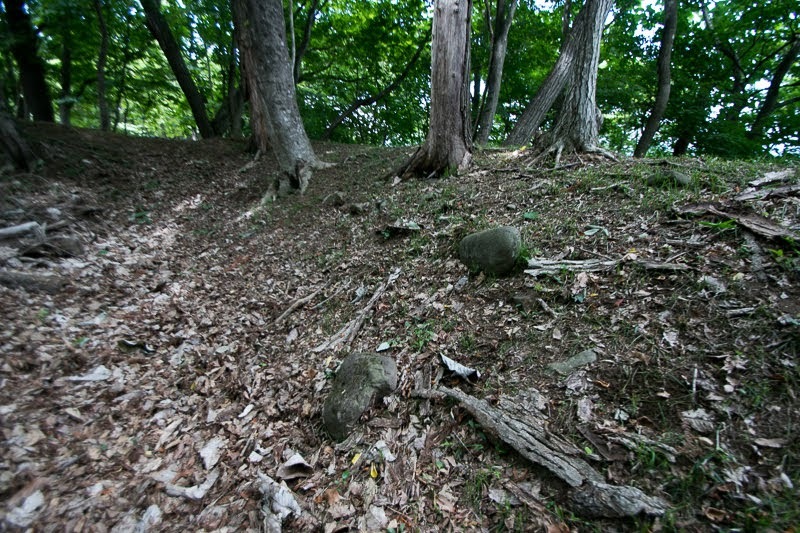 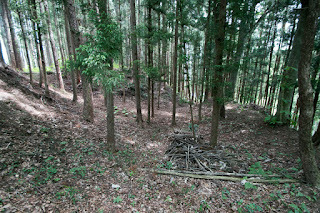 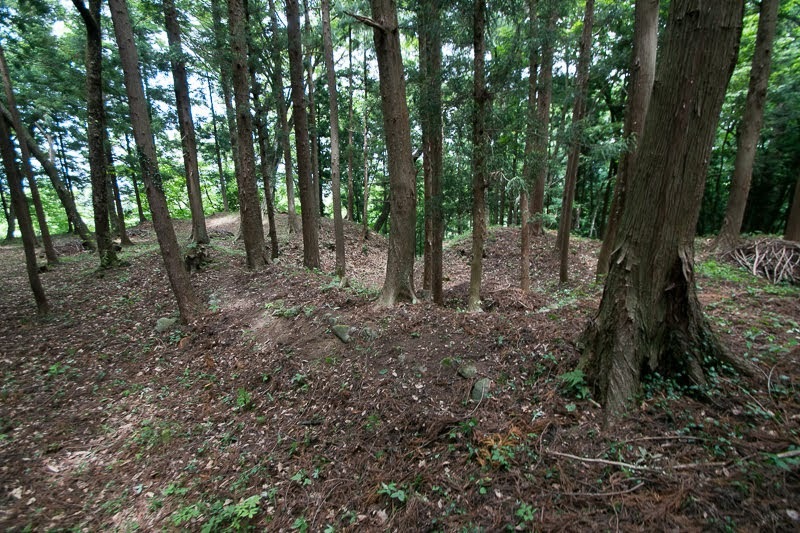 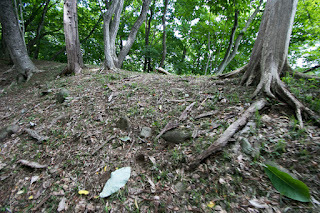 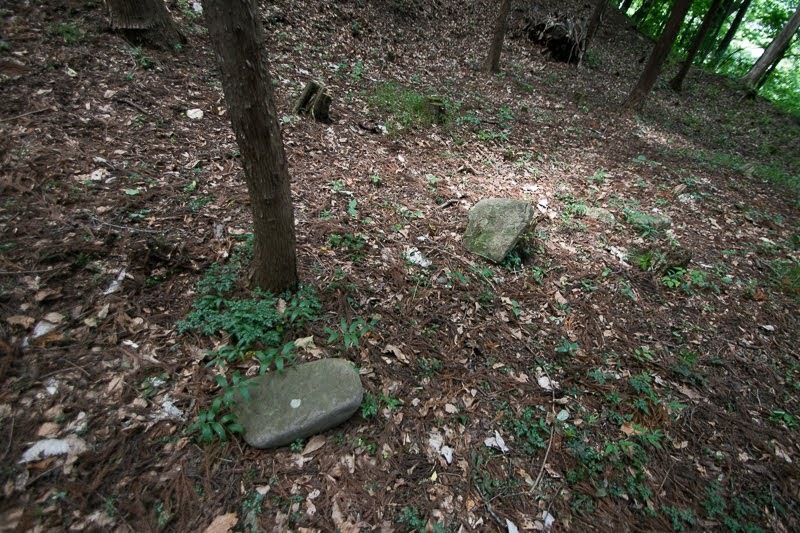 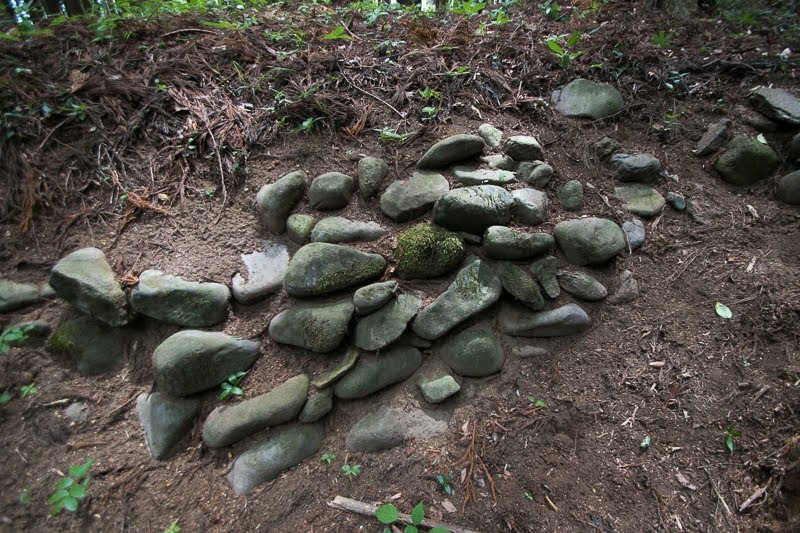 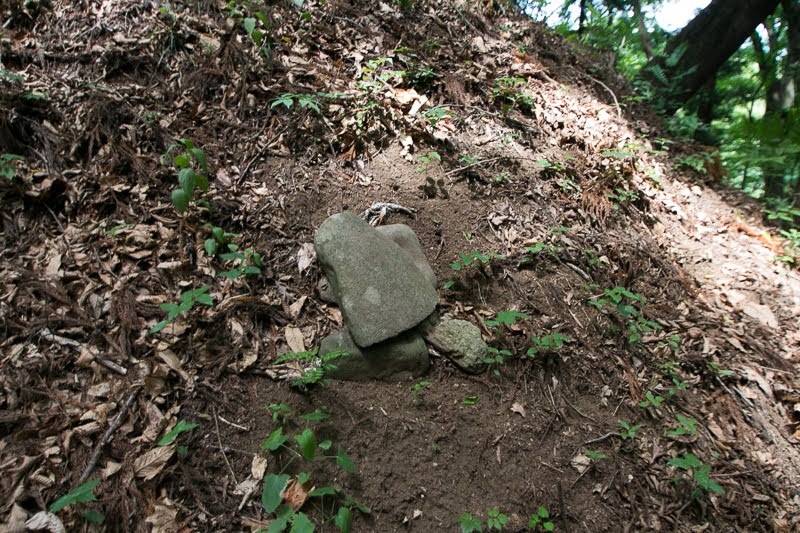 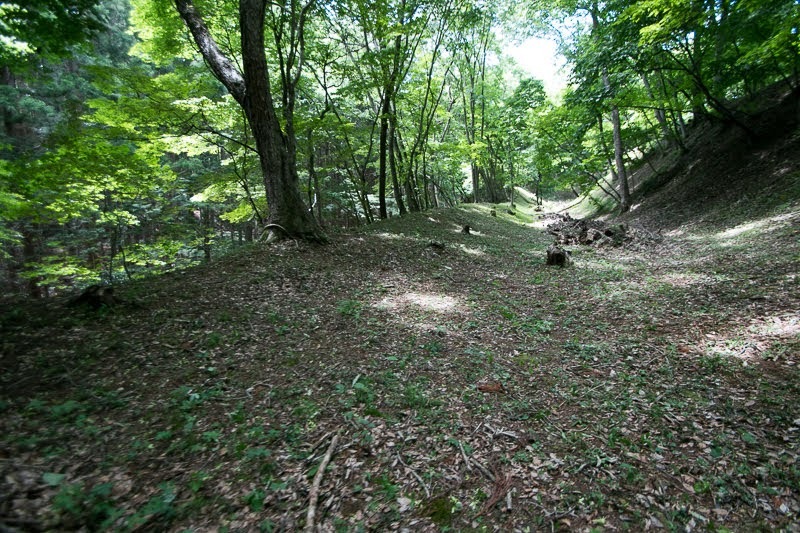 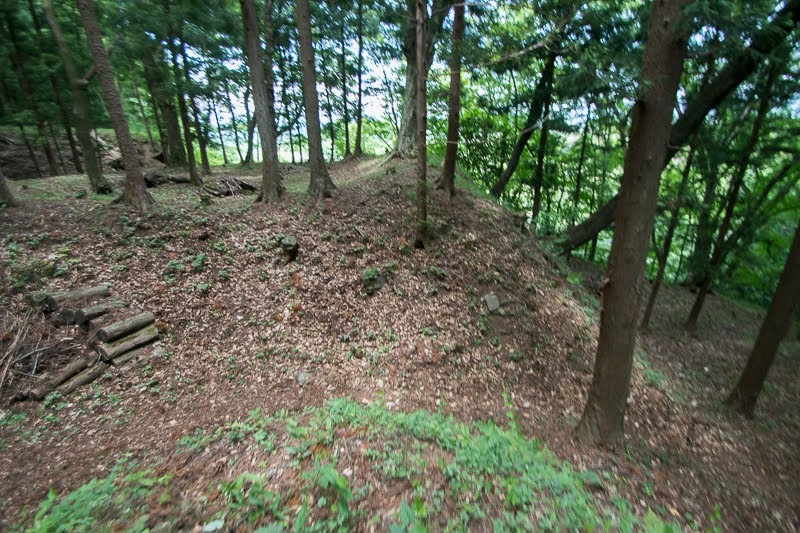 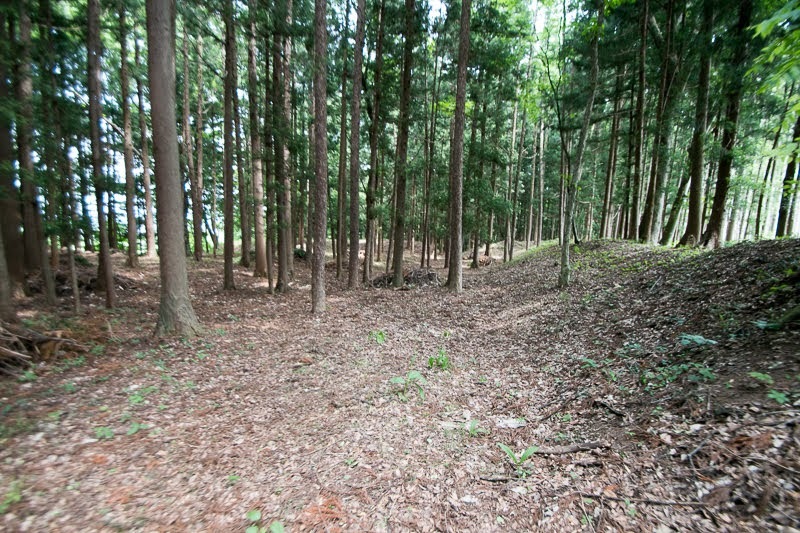 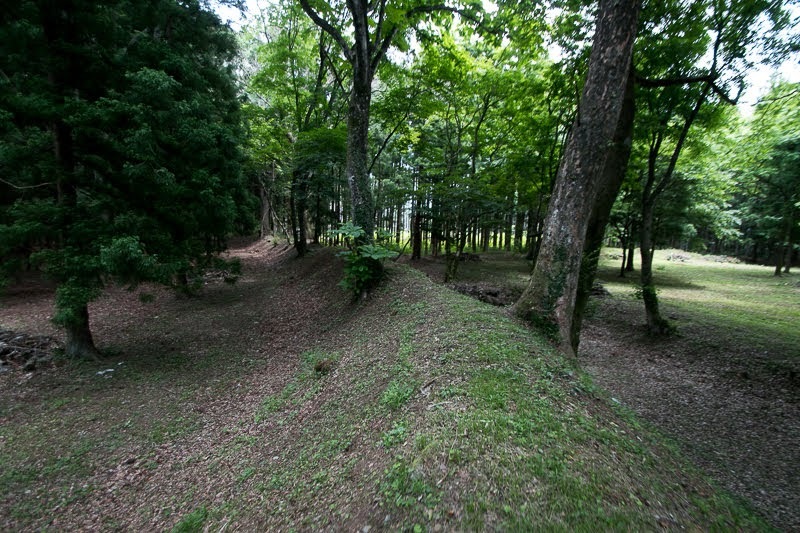 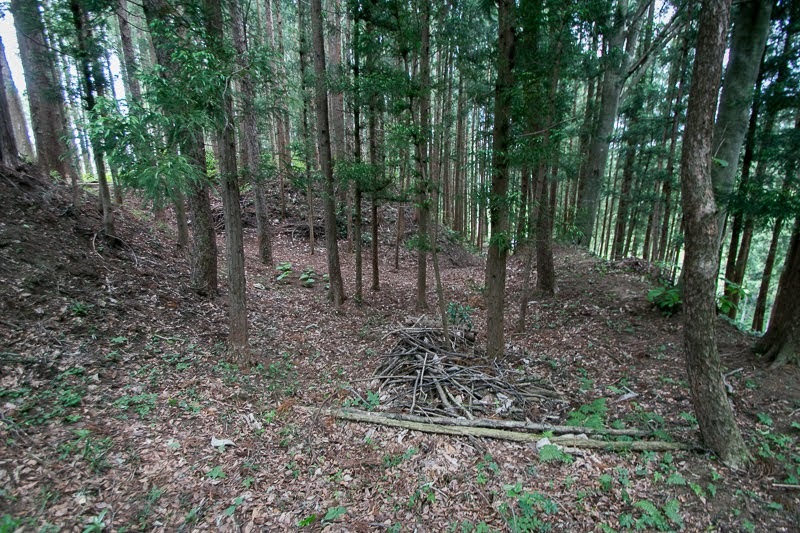 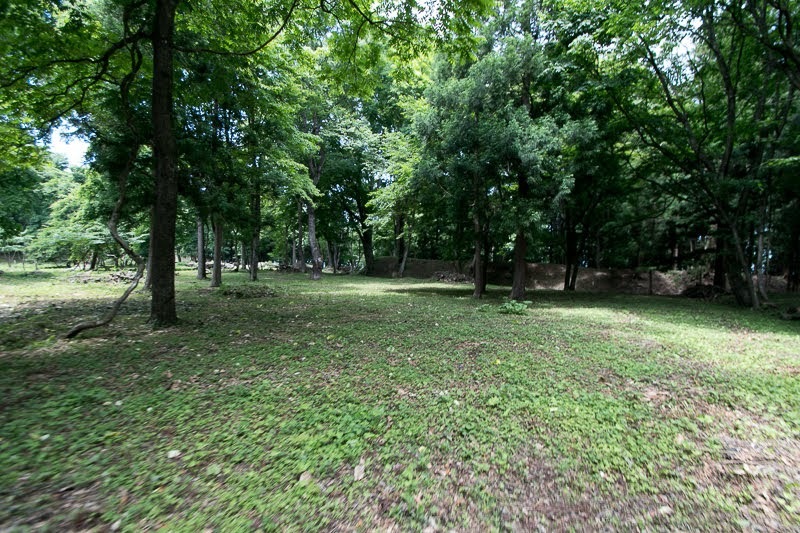 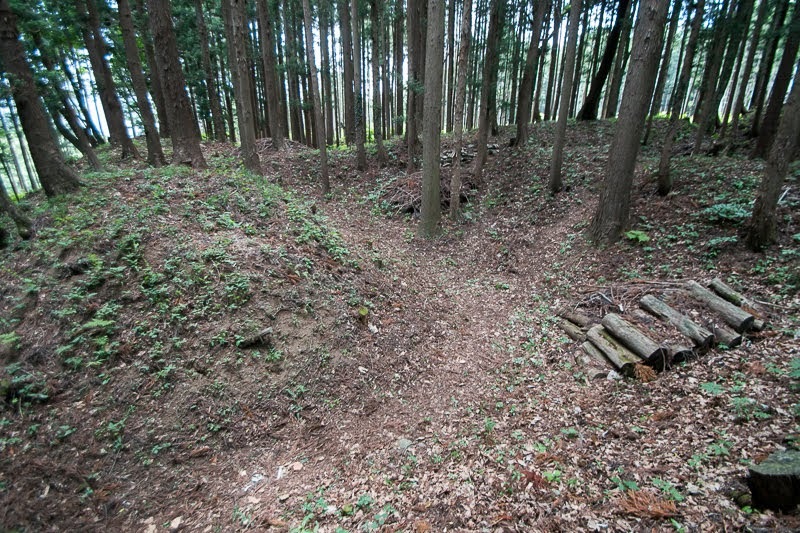 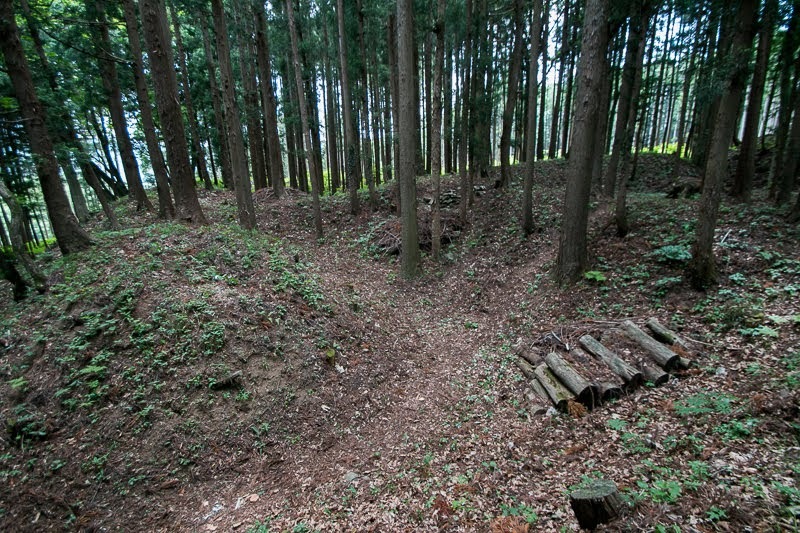 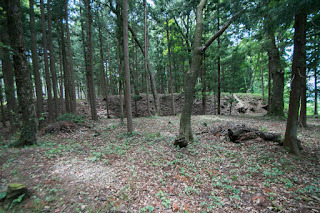 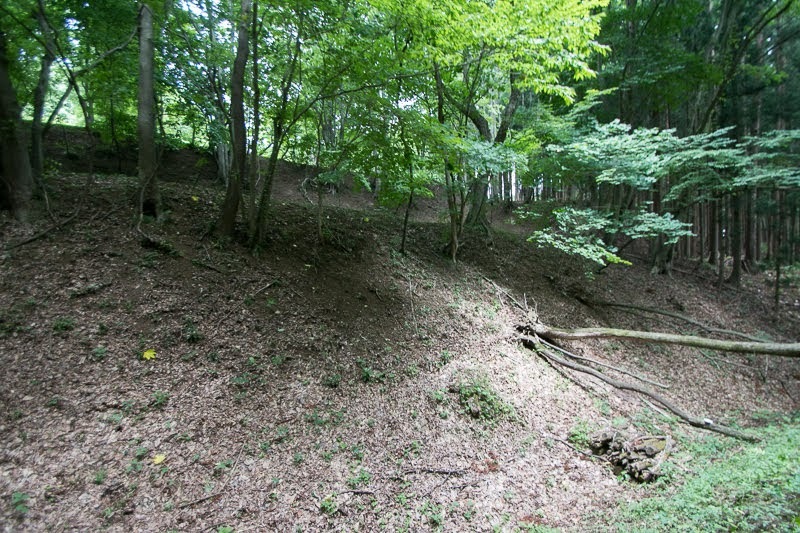 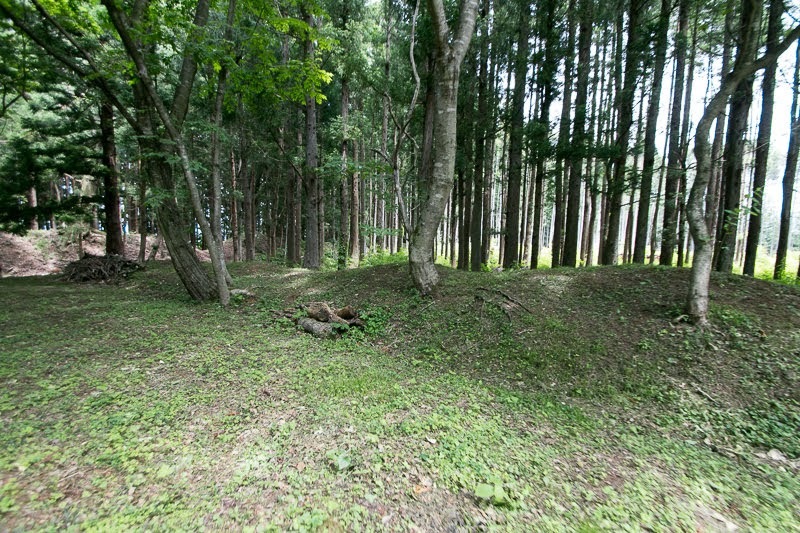 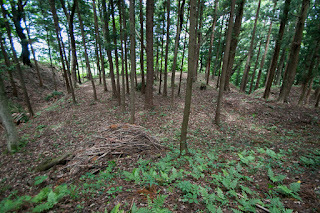 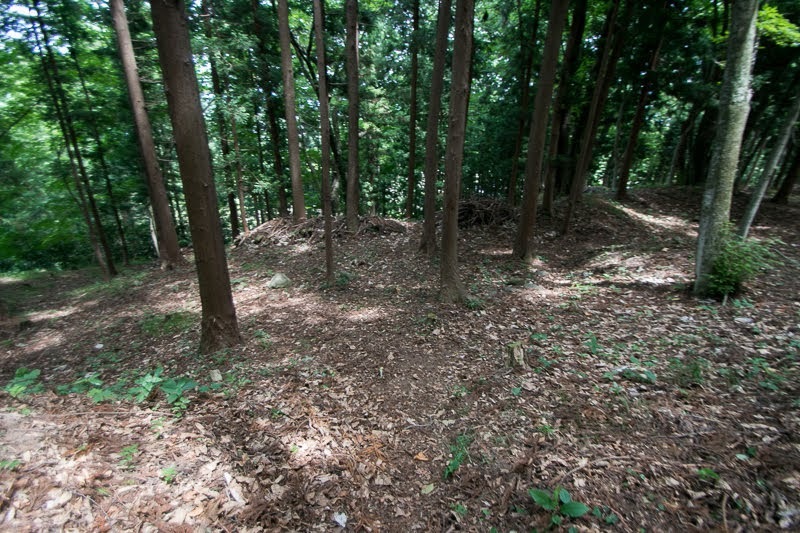 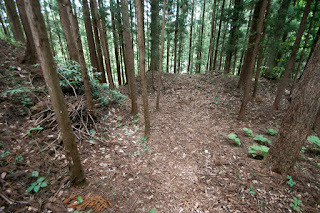 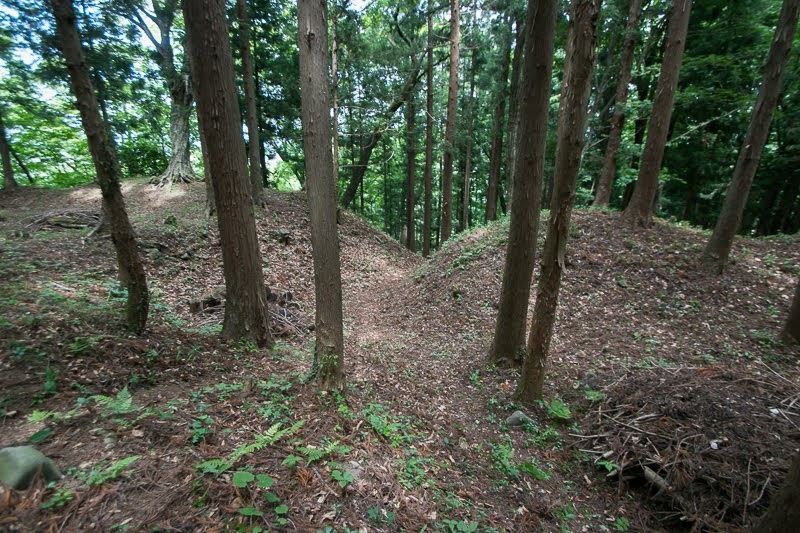 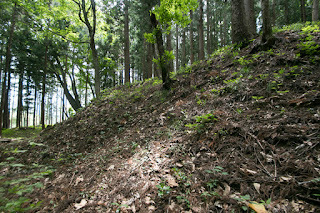 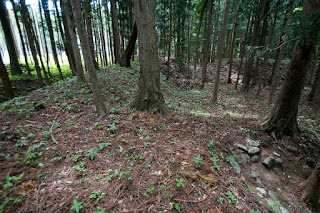 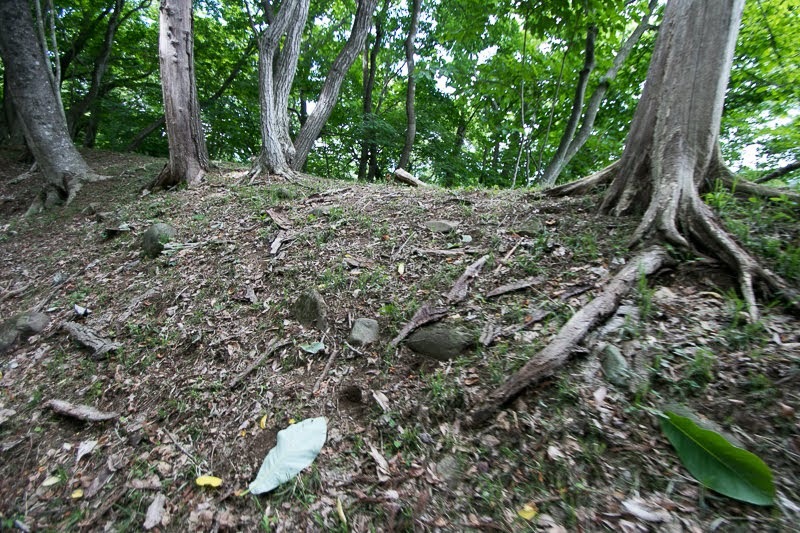 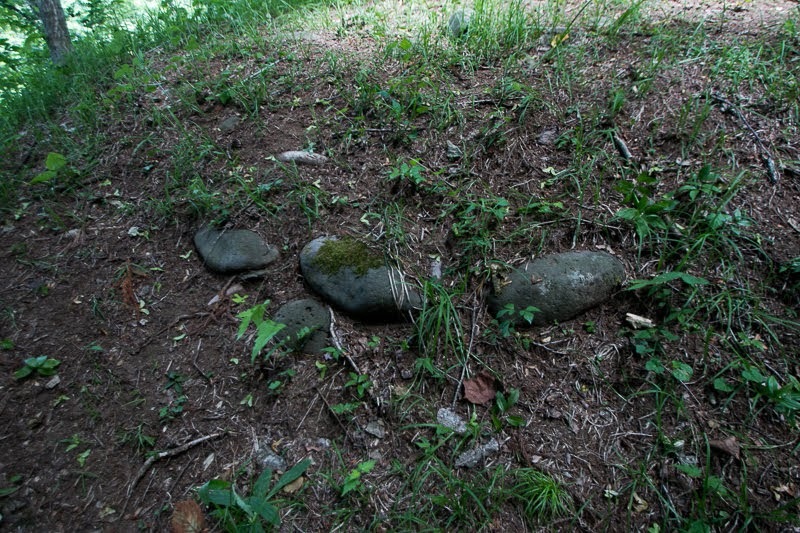 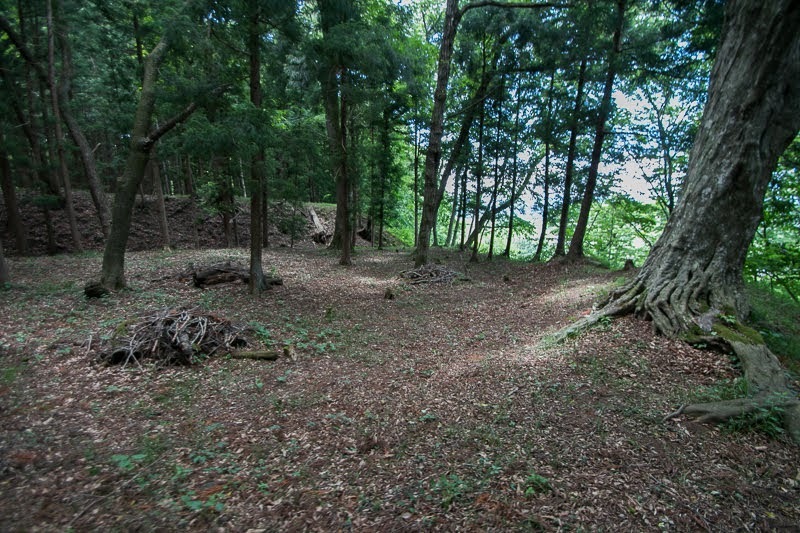 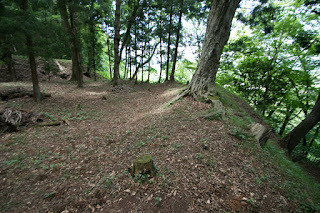 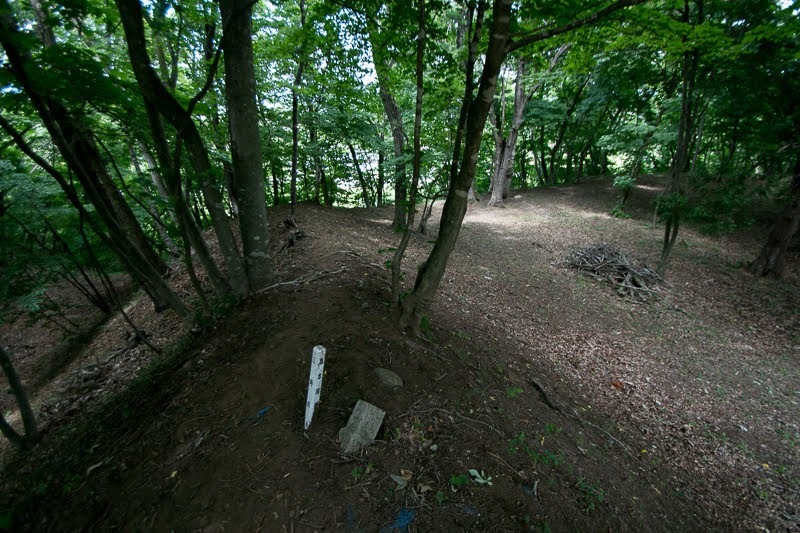 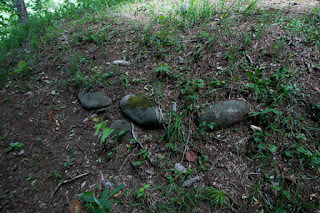 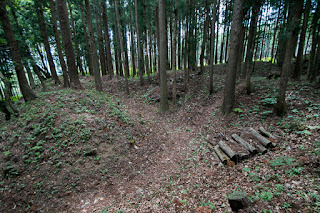 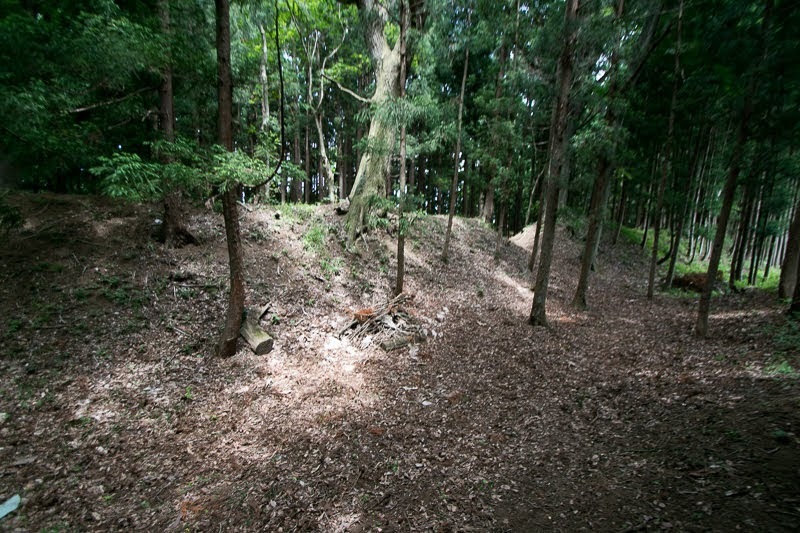 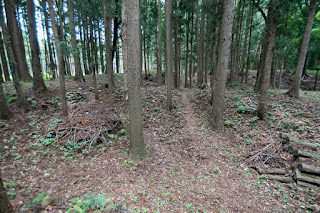 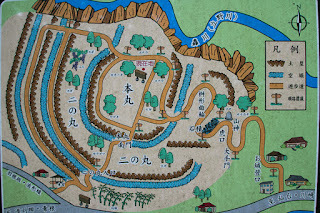 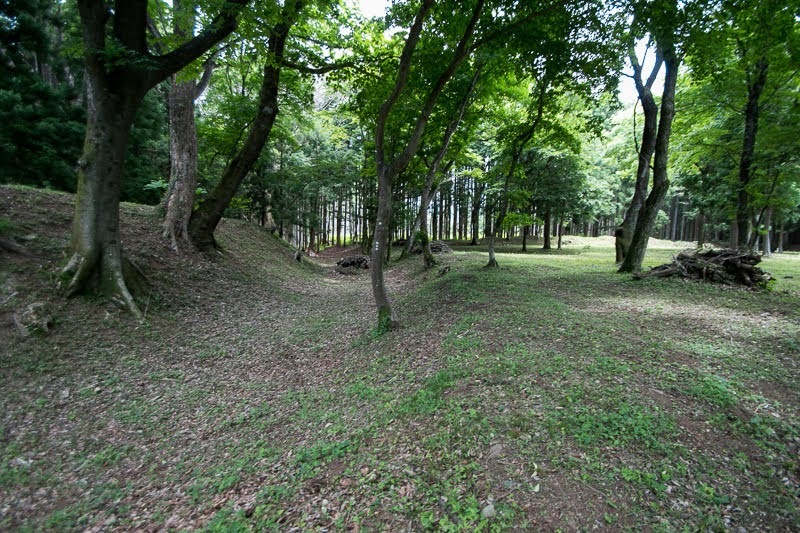 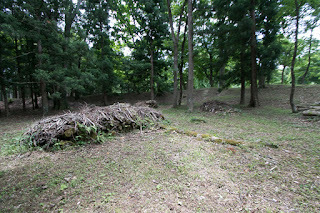 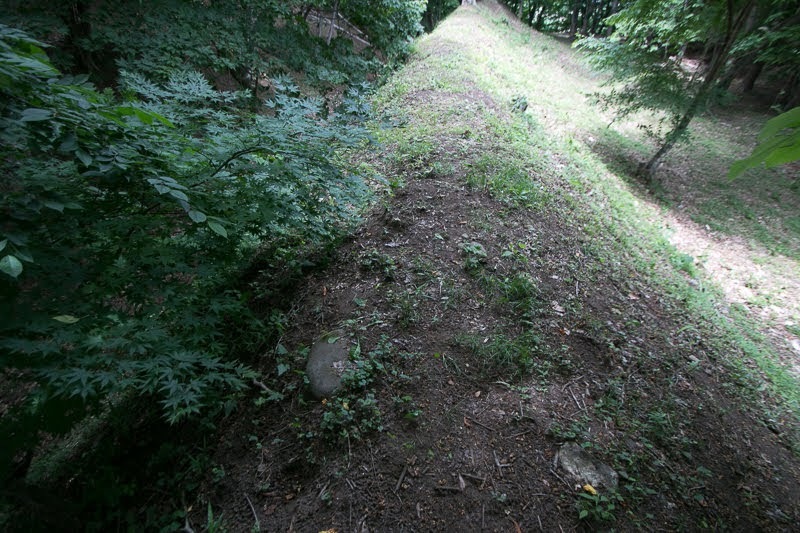 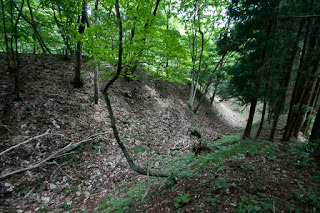 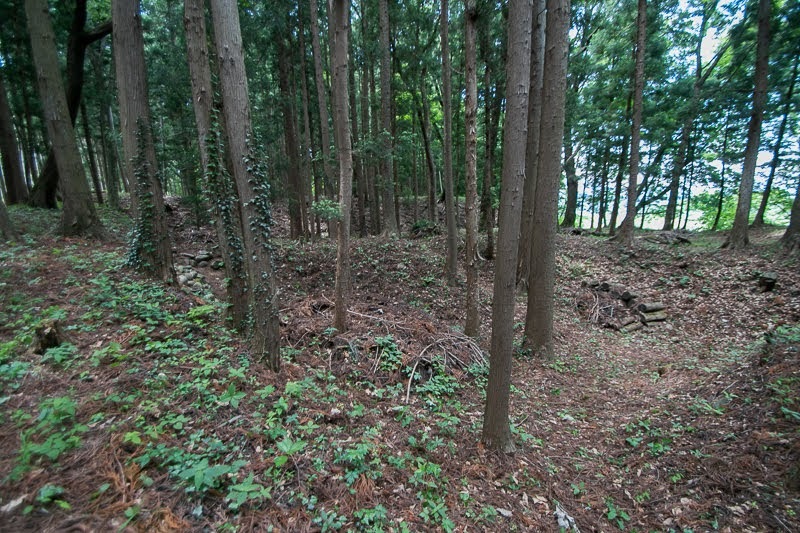 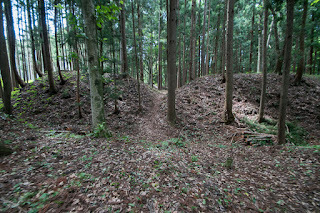 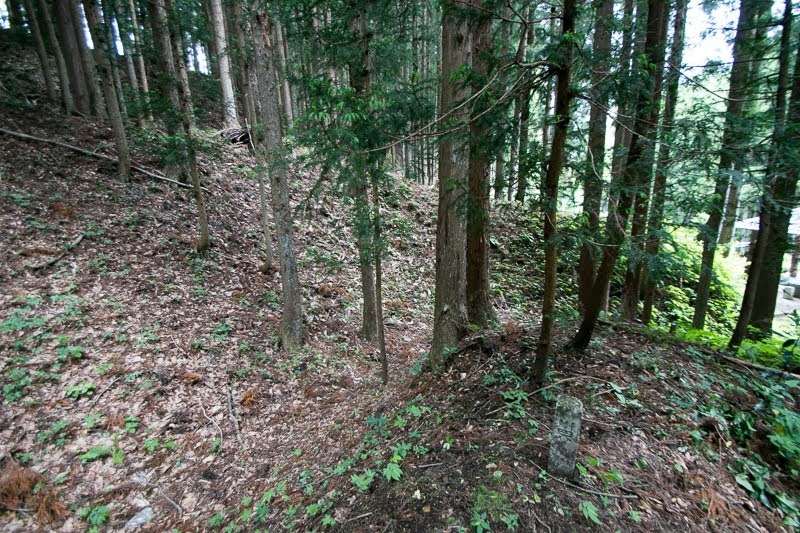 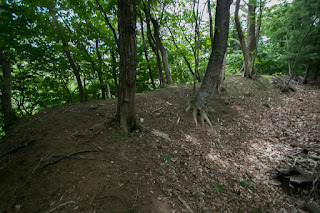 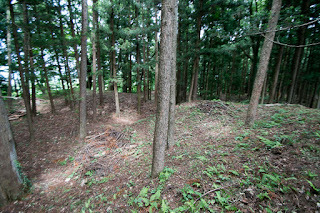 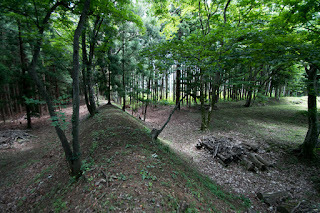 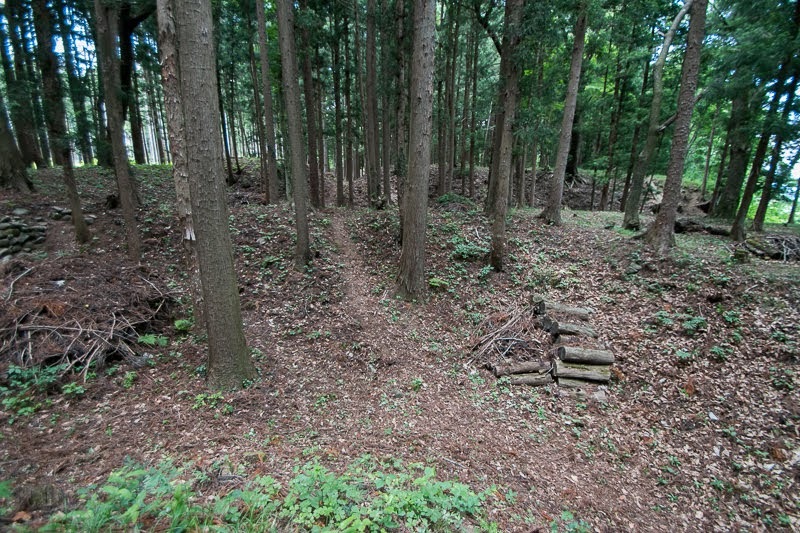 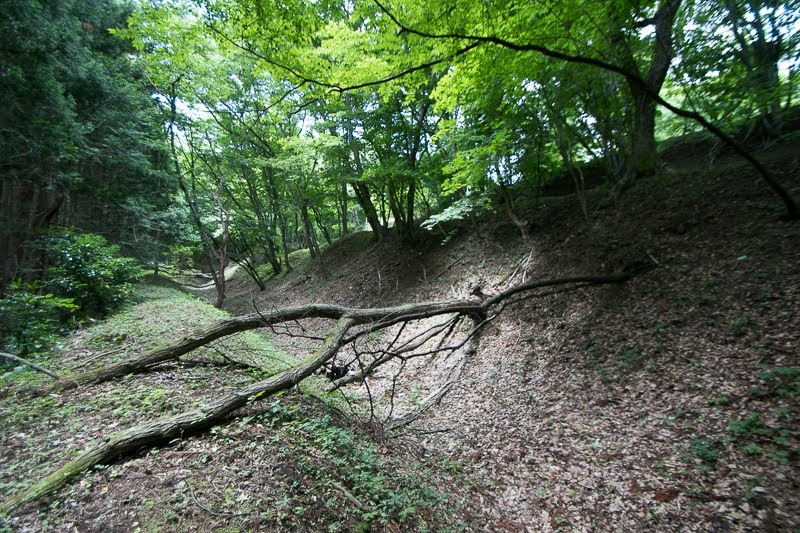 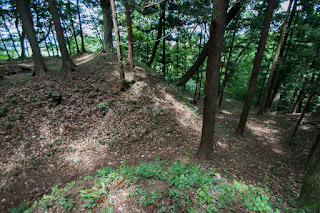 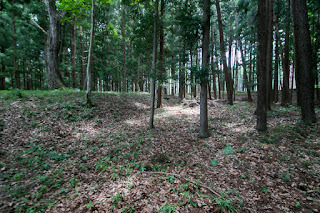 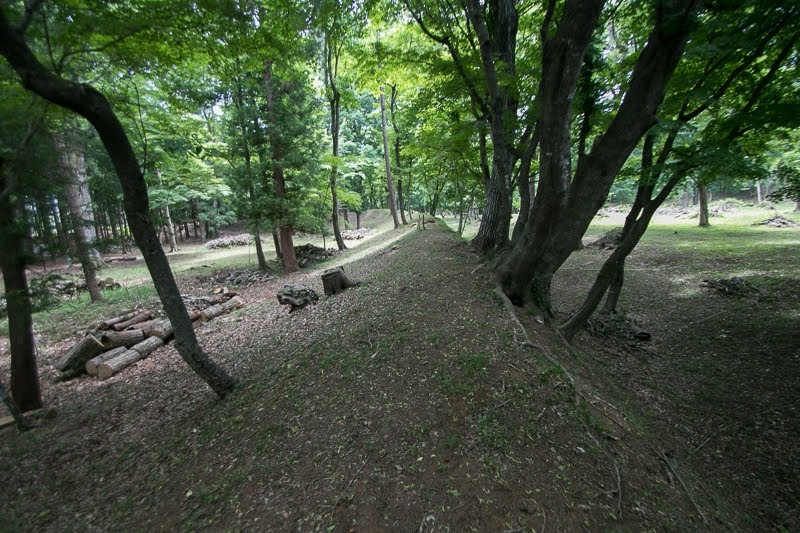 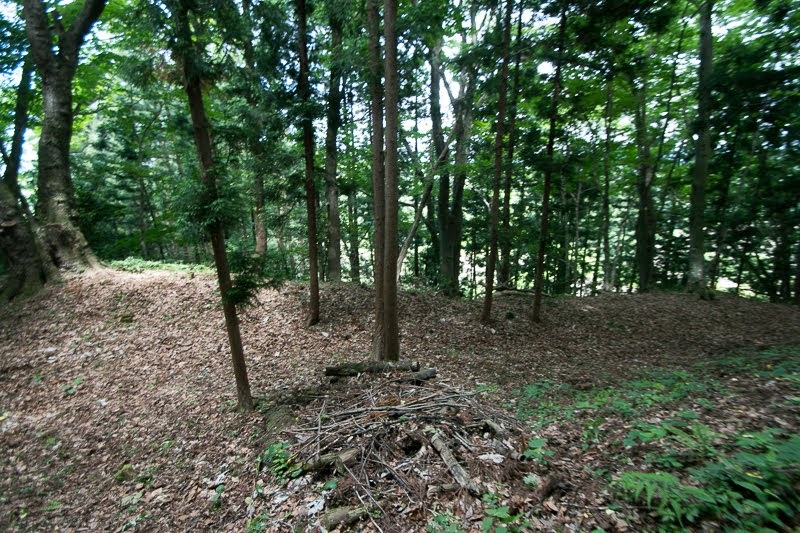 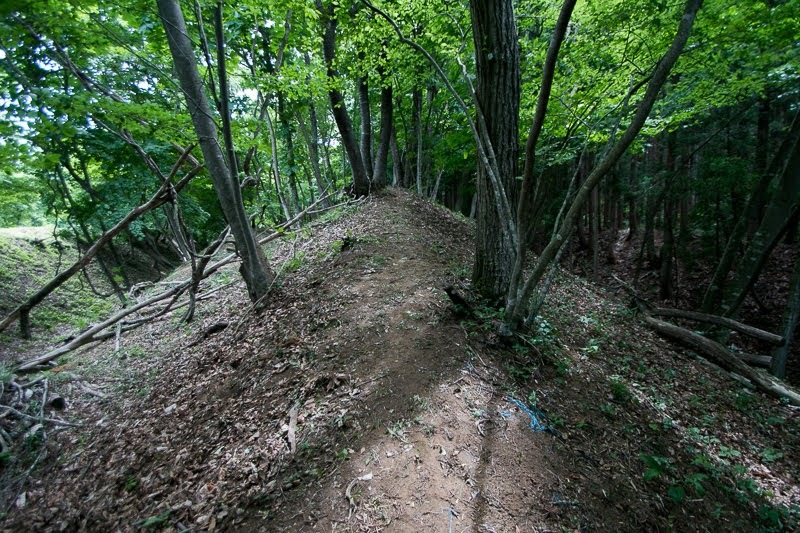 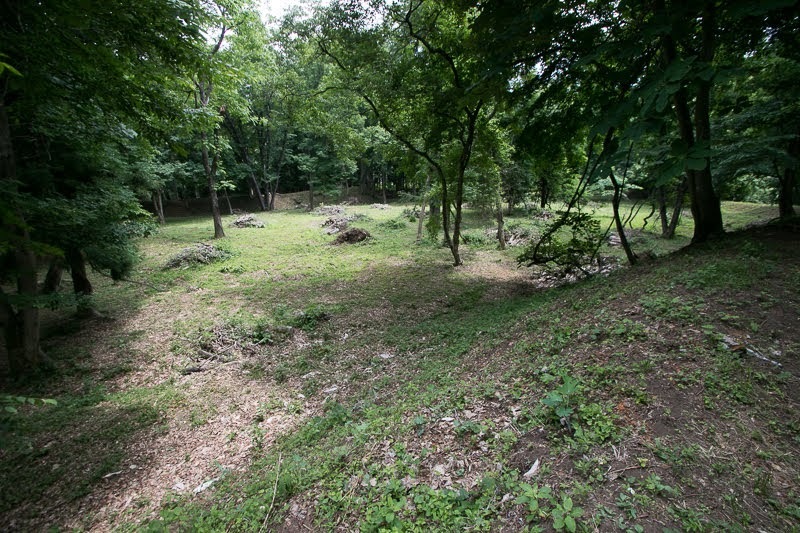 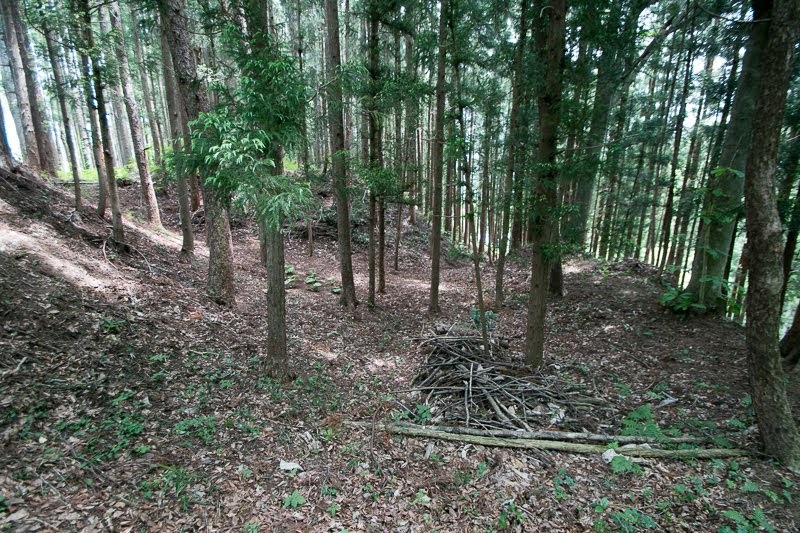 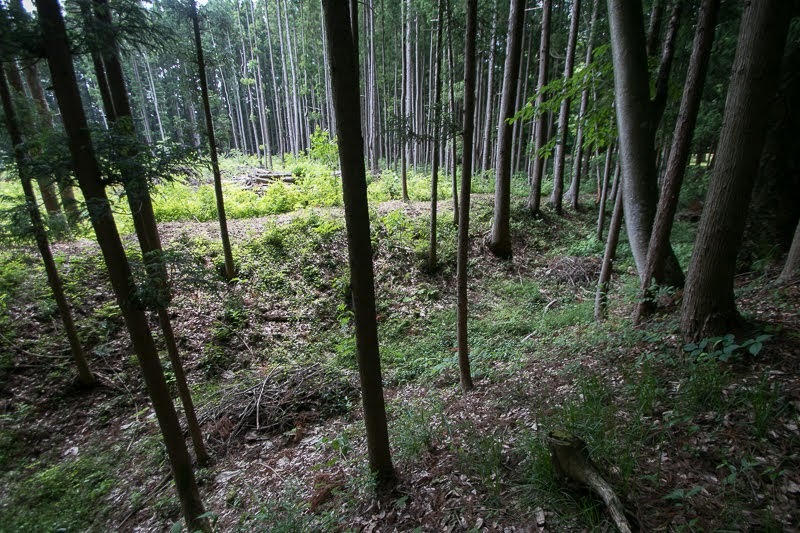 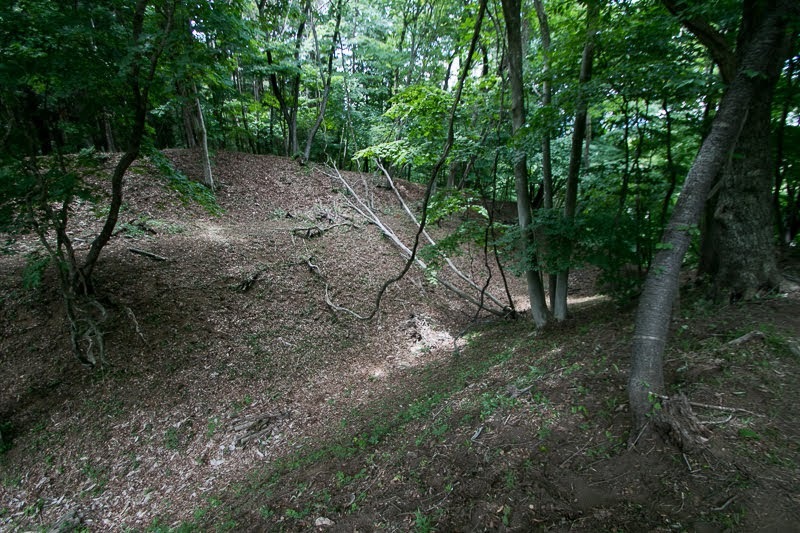 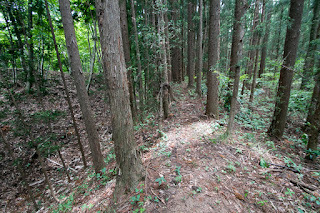 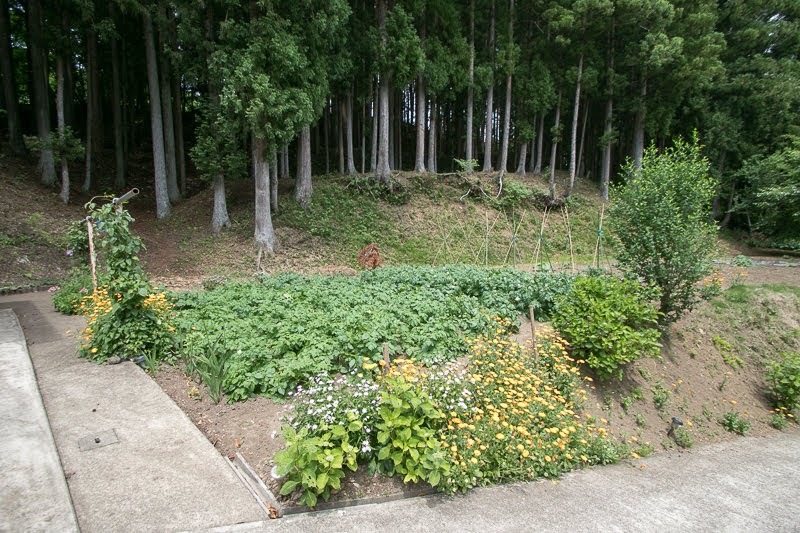 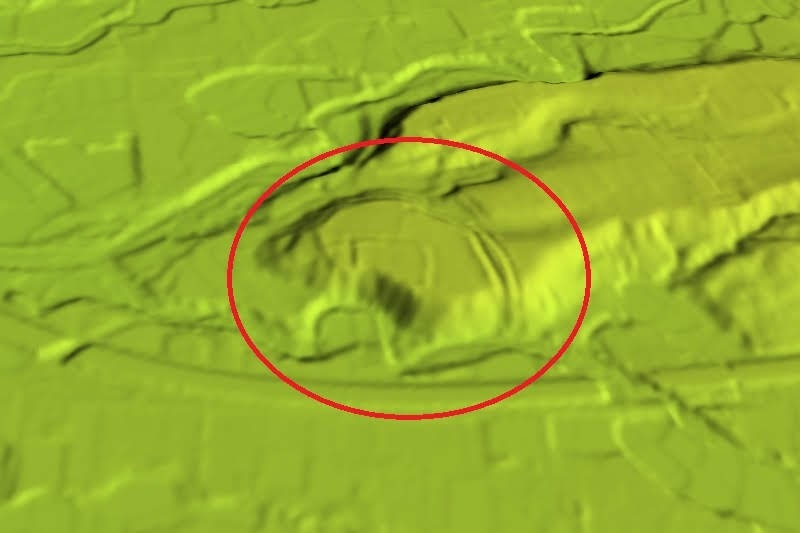 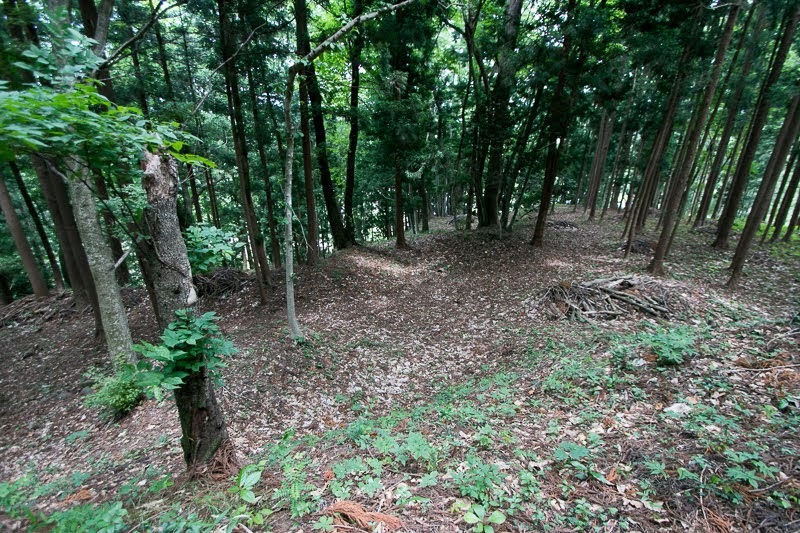 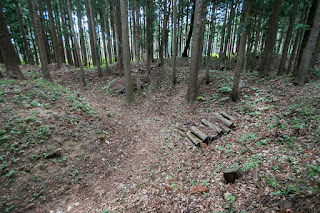 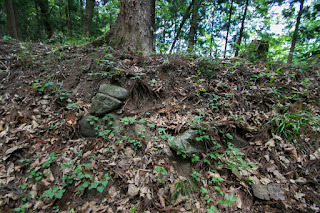 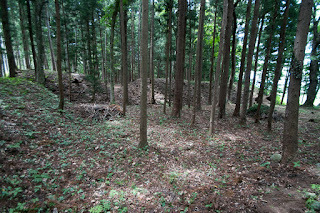 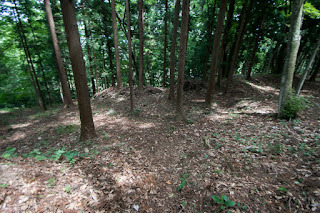 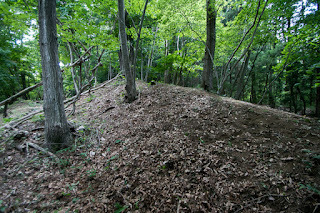 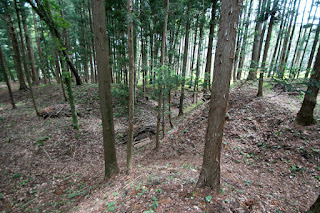 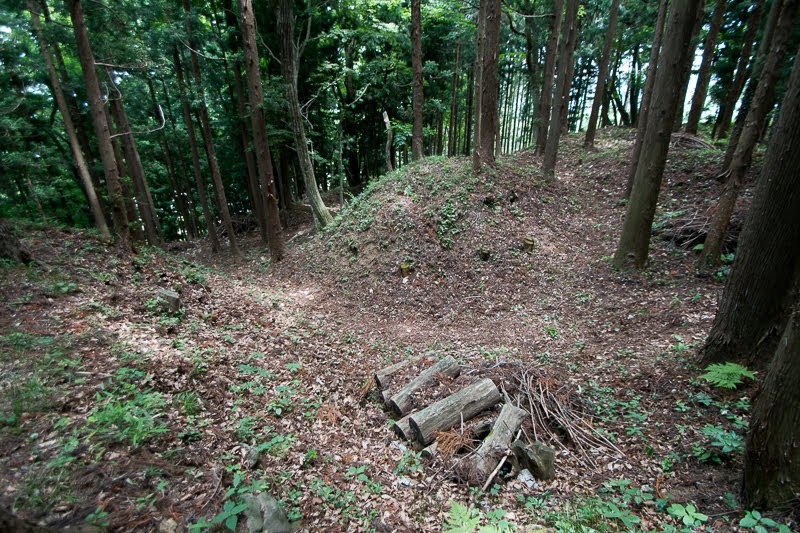 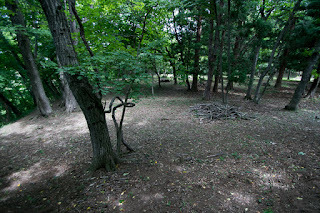 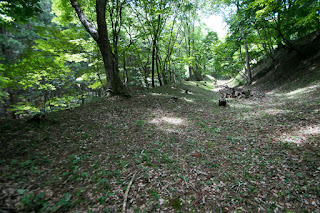 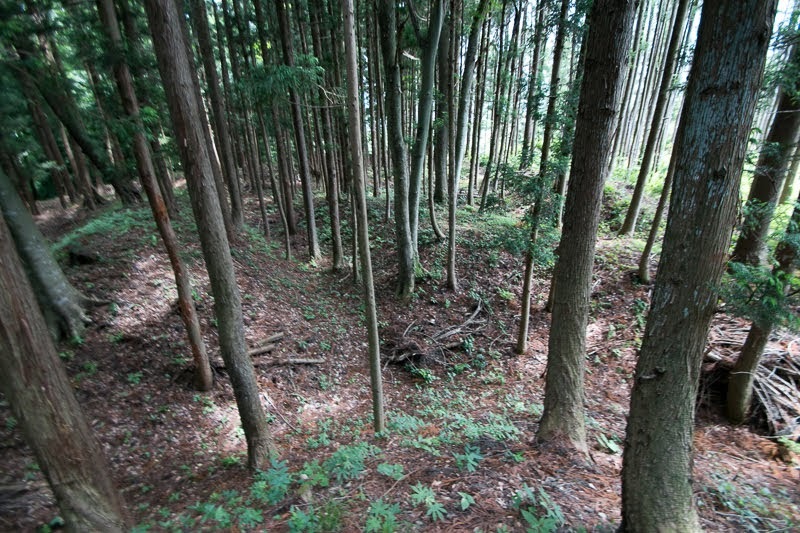 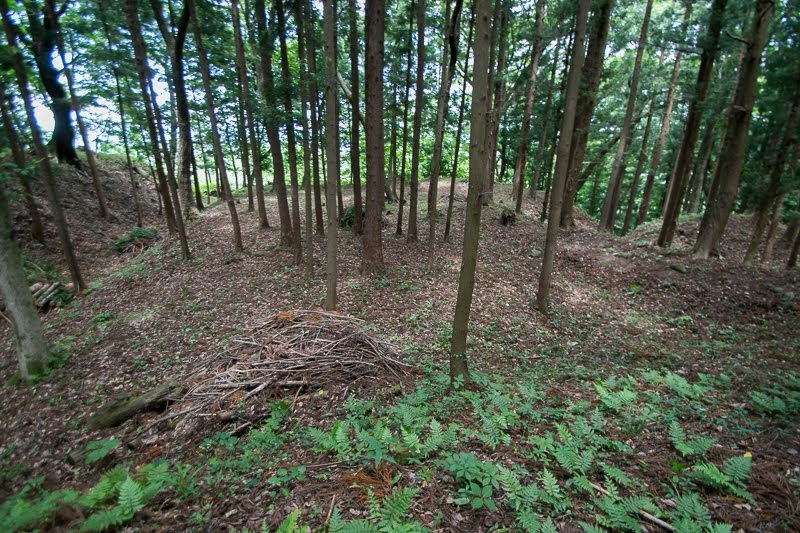 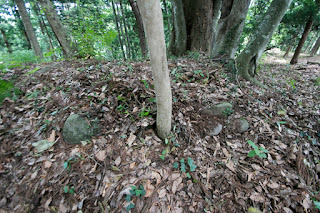 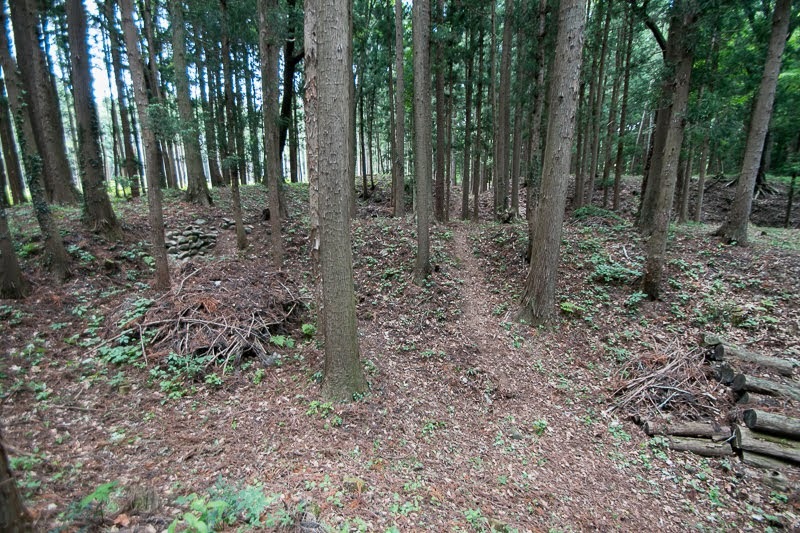 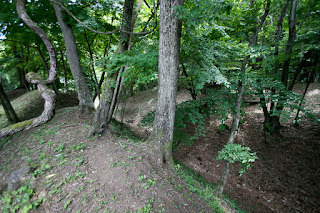 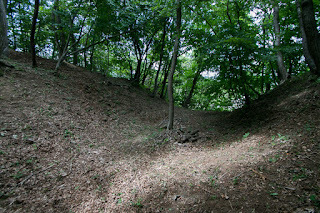 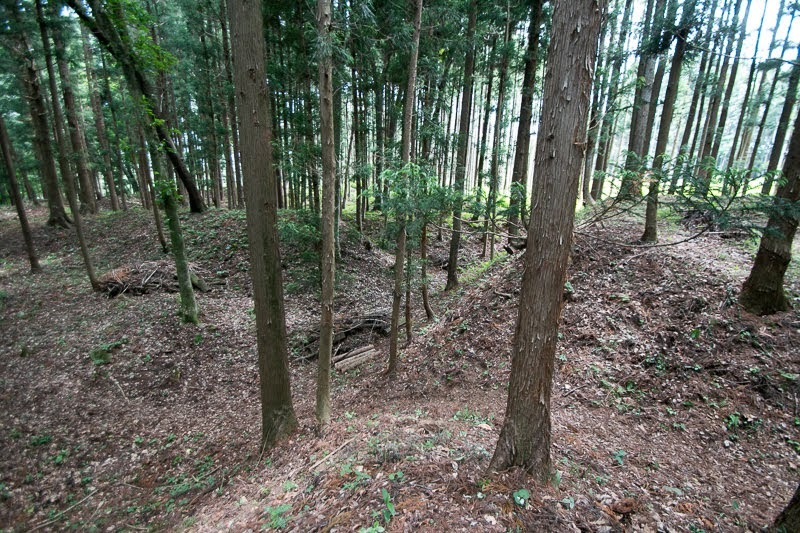 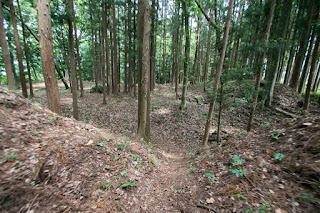 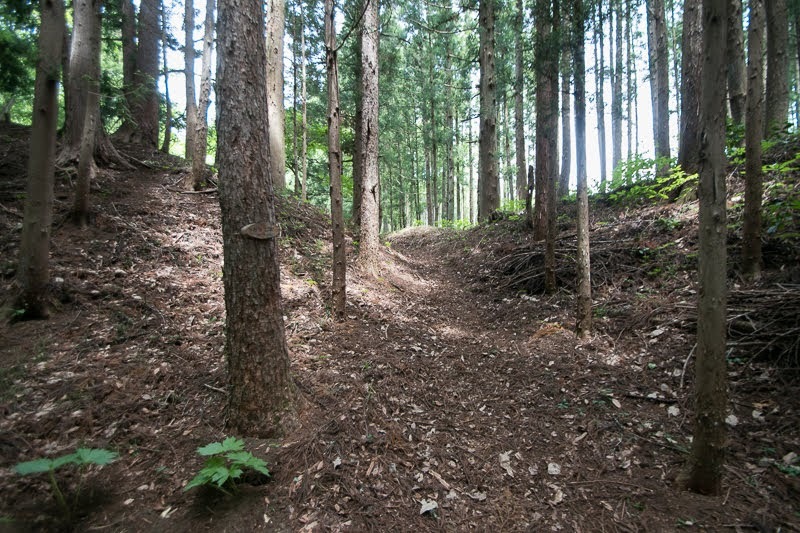 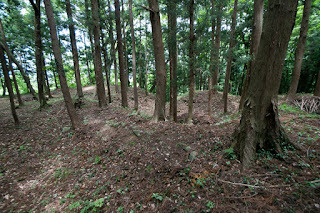 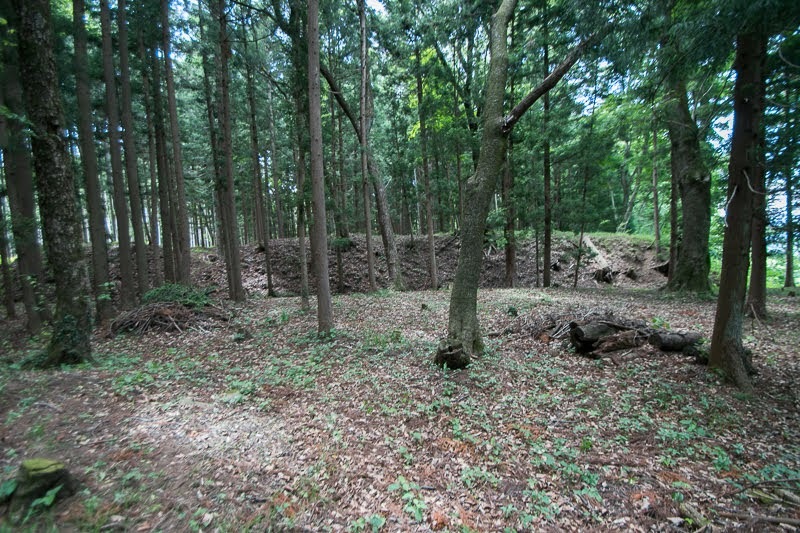 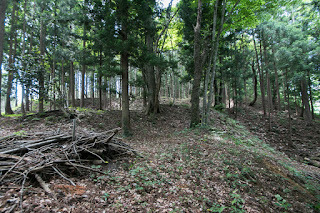 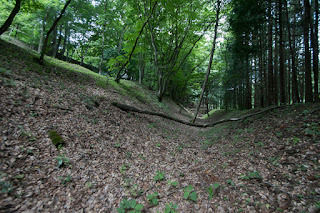 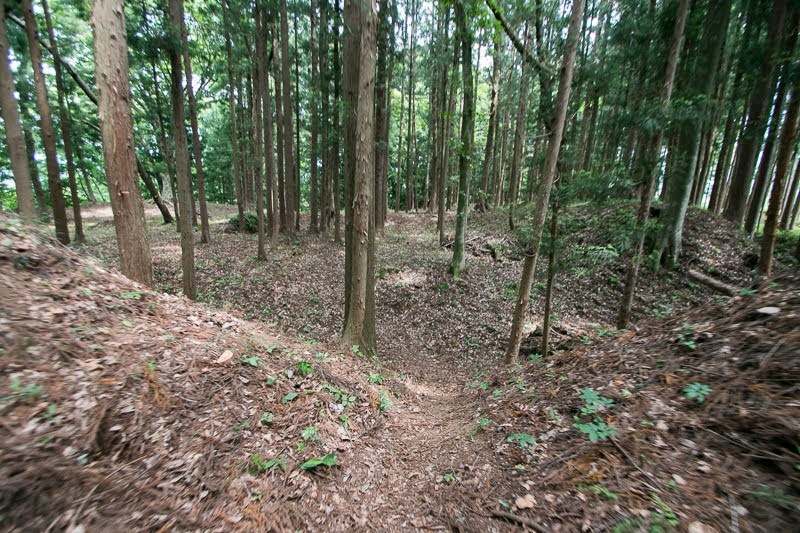 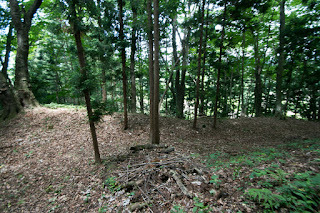 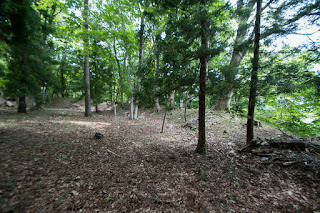 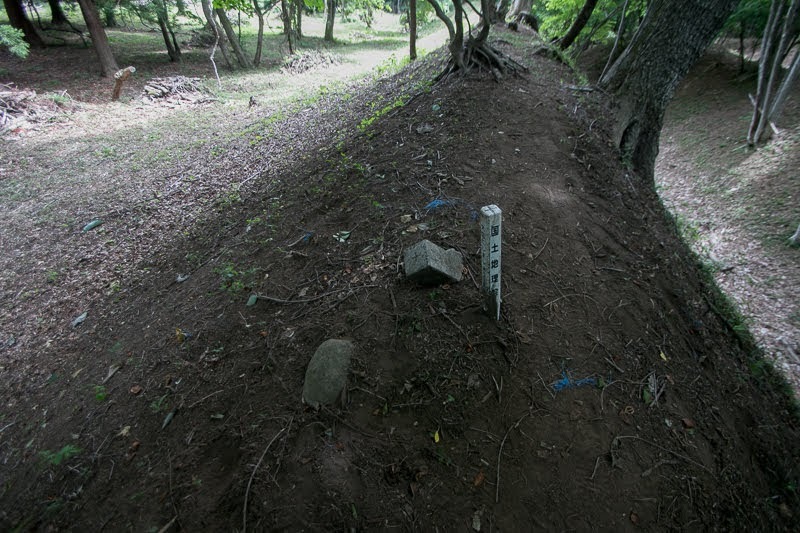 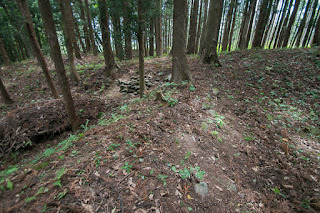 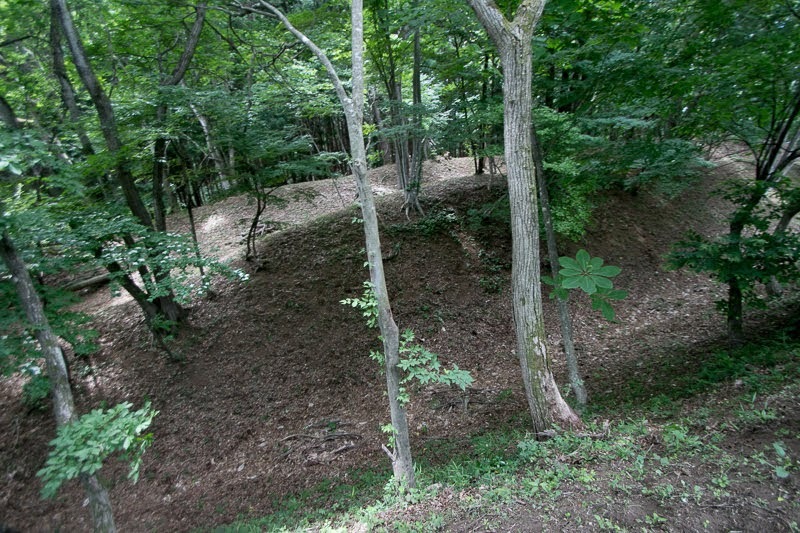 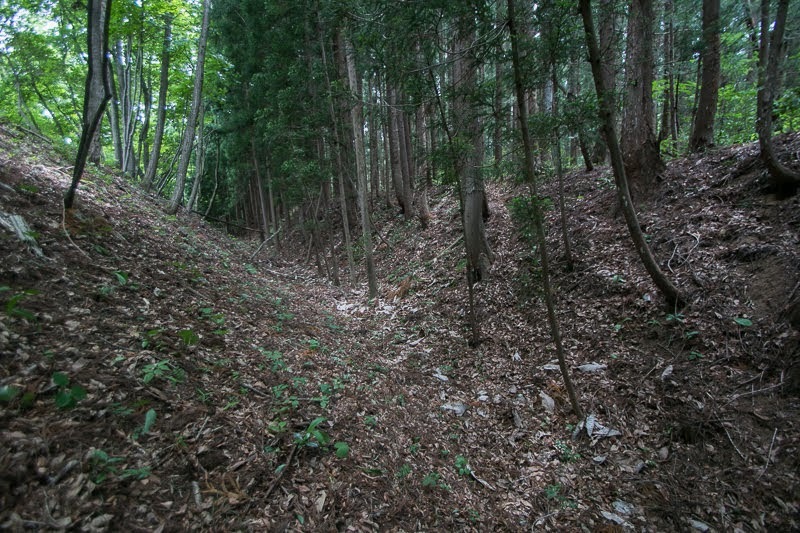 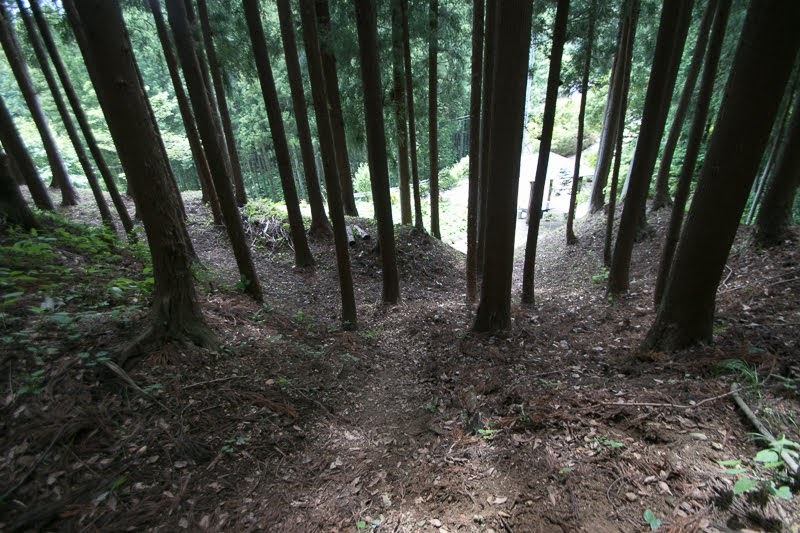 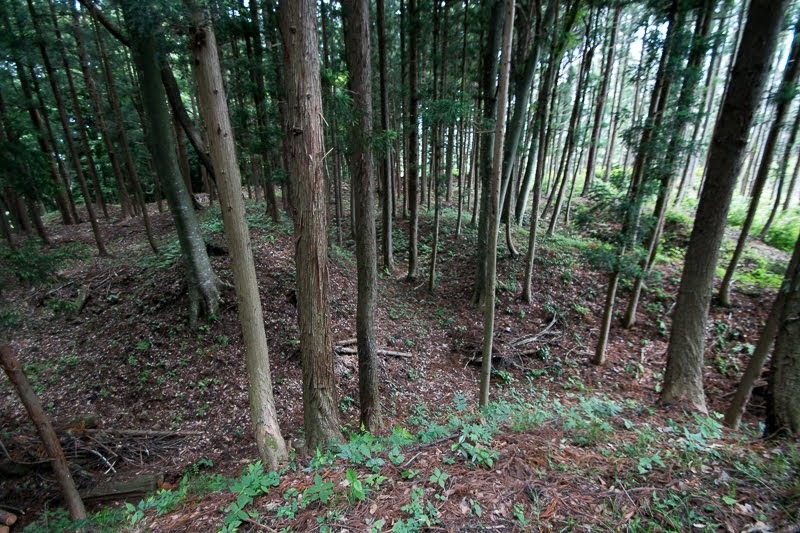 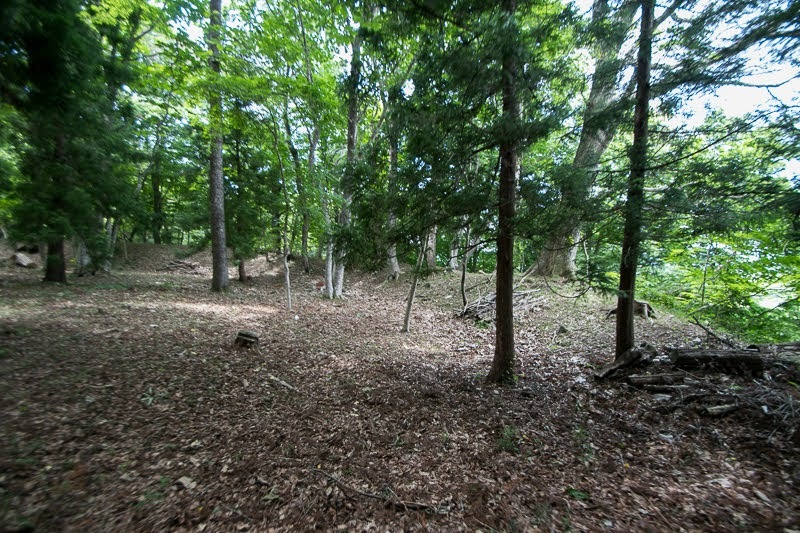 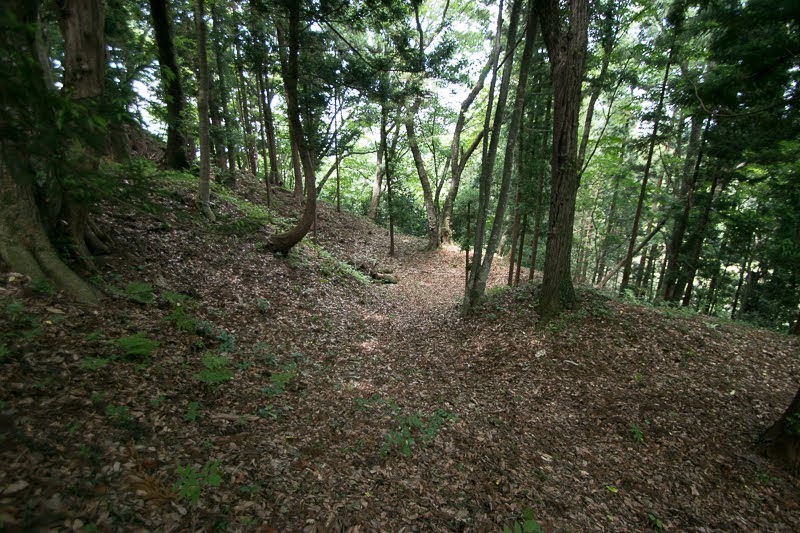 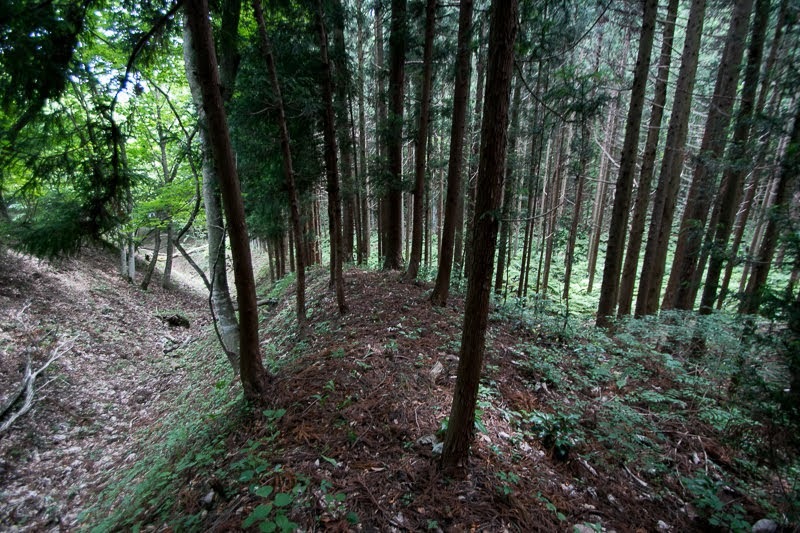 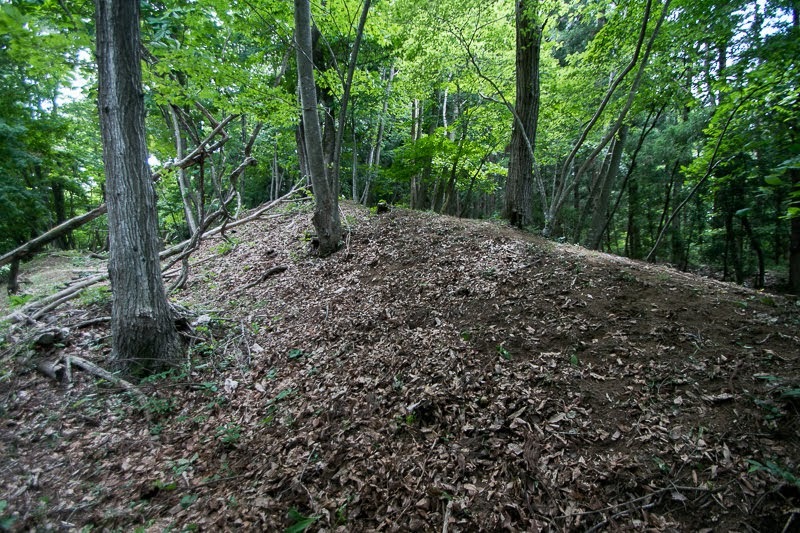 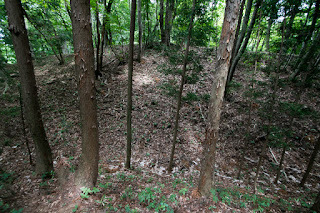 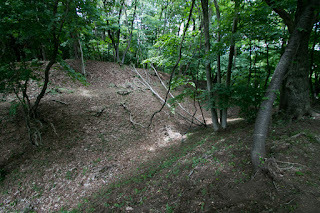 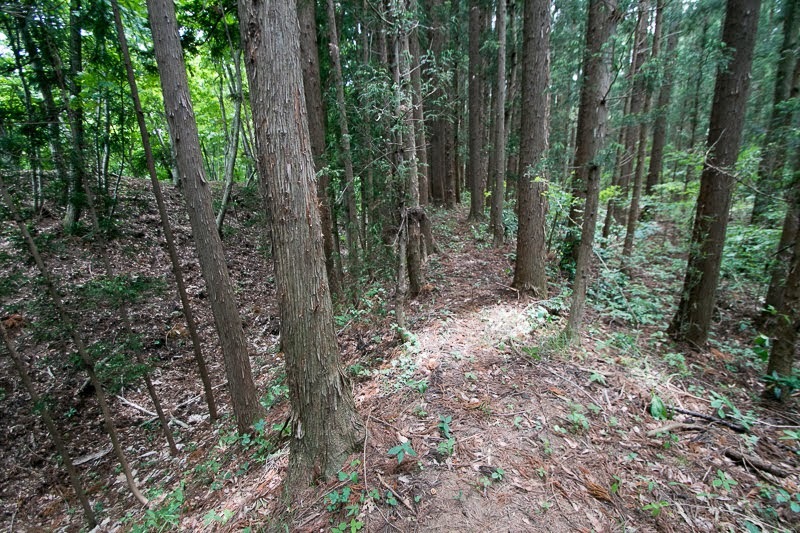 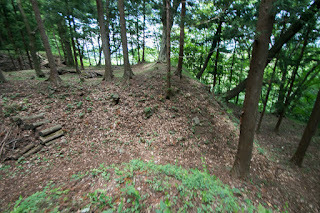 Castle site exists at the east of Zao Mountains, and also 20 kilometer westward from Sendai city central. 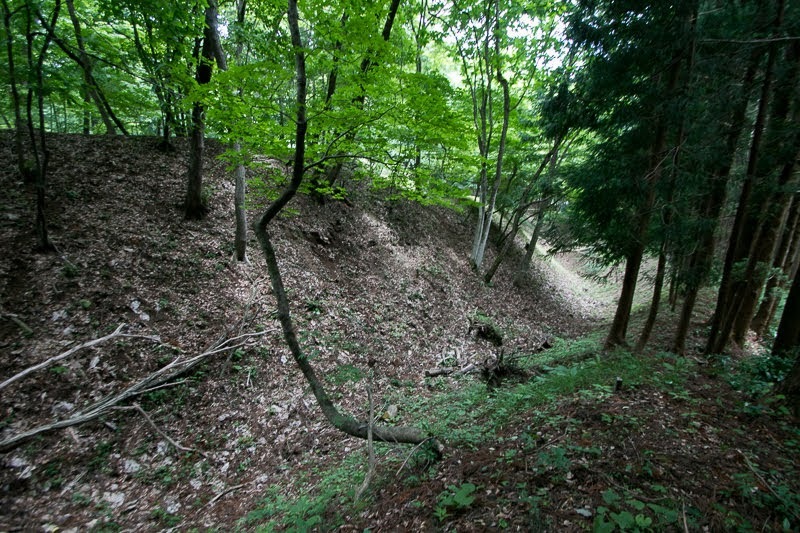 Sasaya Kaido road which runs just the north of castle site and passes Zao Mountains by Sasaya Toge pass has been the main route connecting Sendai plain and Yamagata basin in the shortest distance since ancient era. 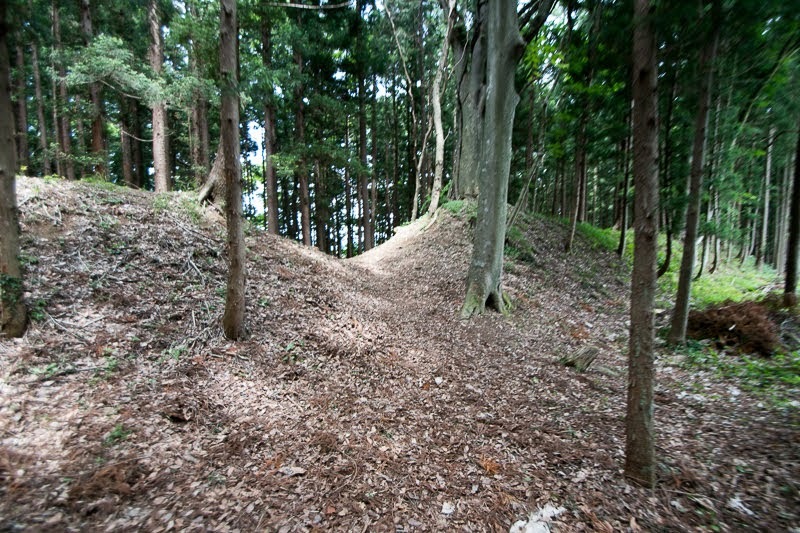 Besides, another mountain route which crosses the mountains by Katta Toge pass also merges at the castle site from southward. 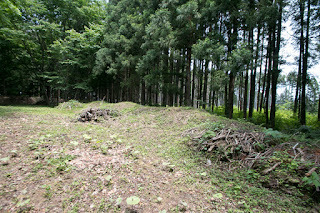 Because of this, this place has been an important place to protect Sendai plain from eastward. At the end of 16th century, middle and south part of Tohoku region was divided by Date clan at northeastern part, Mogami clan at northwestern part and Uesugi clan held south half of the region. 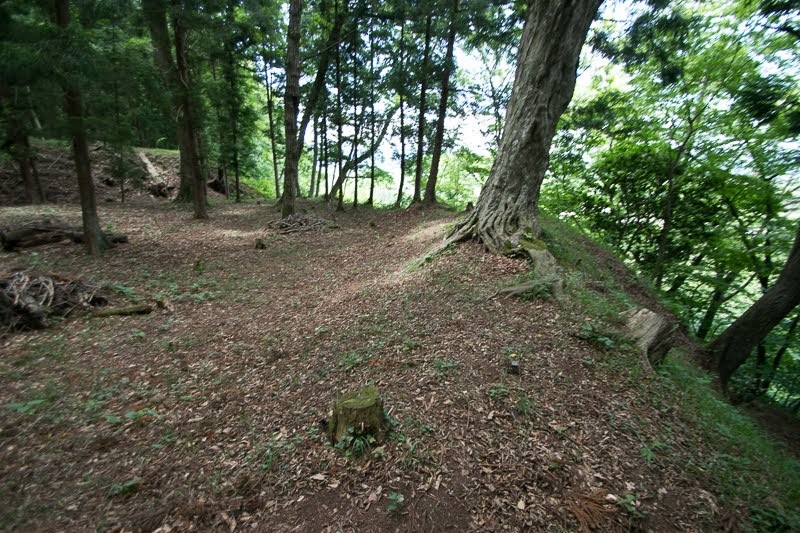 These three clans are traditional clans with long history, and quite conservative at castle building inheriting medieval clay built residence. 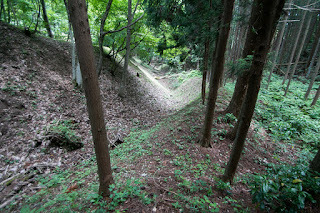 But if necessary they also built progressive castles, and Nakanouchi castle was one of such castles. 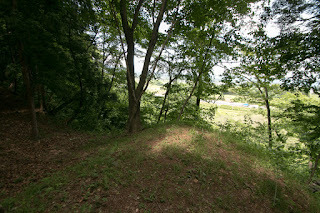 Nakanouchi castle might be built by local lord Isago clan in 1575. The origin of Isago clan is not clear and is said as a descendant of retainer of Yoshitune Minamoto (1159-1189), a younger brother of Yoritomo Mimamoto (1147-1199), the founder of Kamakura Shogunate, but finally ruined by Yoritomo. 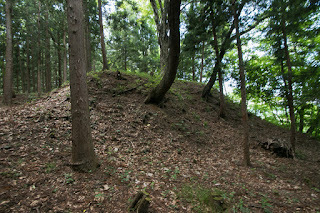 Anyway Isago clan became the local lord of Kawasaki area and became the retainer of Date clan. 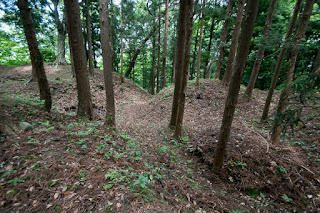 Date clan was a traditional clan which activated at the battle of Yoritomo Minamoto against Oshu Fujiwara clan held at Date area, then was appointed as the magistrate of the area by Kamakura Shogunate at the end of 12th century. 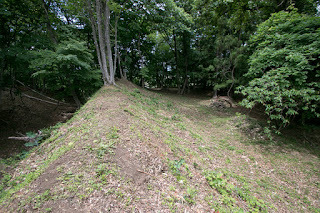 Once declined among the conflict between the North Court and South Court, but steadily grew their power. Date clan was at first placed under Osaki clan, the supervisor of Mutsu province (Pacific Ocean side of Tohoku region), but directly connected to Muromachi Shogunate utilizing horses and gold produced in their territory. 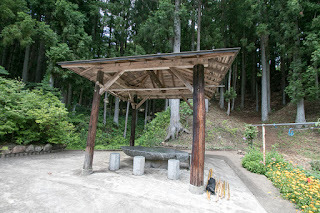 Later Date clan was nominated as the governor of Mutsu province and exceeded its nominal lord Osaki clan. 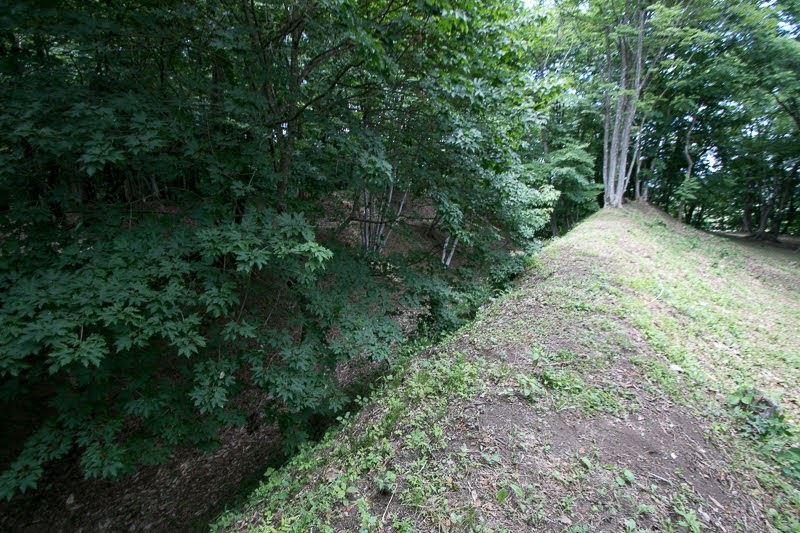 In the former half of 16th century, after expansion Date clan experienced continuous severe internal conflicts and significantly declined its power. 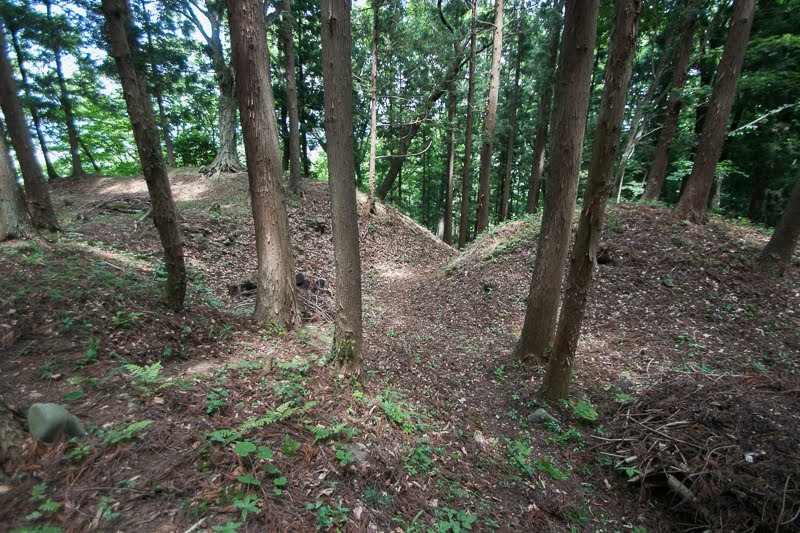 But at the time of Terumune Date (1544-1585), Date clan overcame its internal conflicts and again started its expansion in 1570’s. 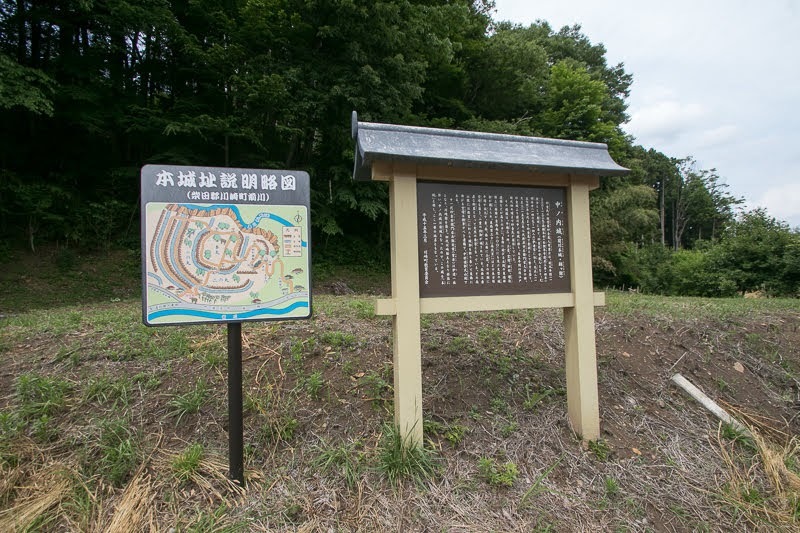 On the other hand, at the opposite side of Zao Mountains, Yoshiaki Mogami (1546-1614), the leader of Mogami clan who also overcame an internal conflict against his father, also started expansion to restore the position of supervisor of Dewa province (Sea of Japan side of Tohoku province). Although Princess Yoshihime (1548-1623), the wife of Terumune Date was a younger sister of Yoshiaki Mogami, Date clan and Mogami clam were on cat and dog term as once Date clan forced Mogami clan to follow but later Mogami clan left it during the internal conflict of Date clan. 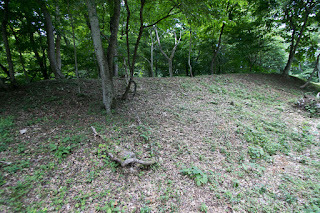 Facing fierce attack of Date clan toward surrounding lords, Yoshiaki Mogami supported the enemies of Date clan to prevent the expansion of Date clan. 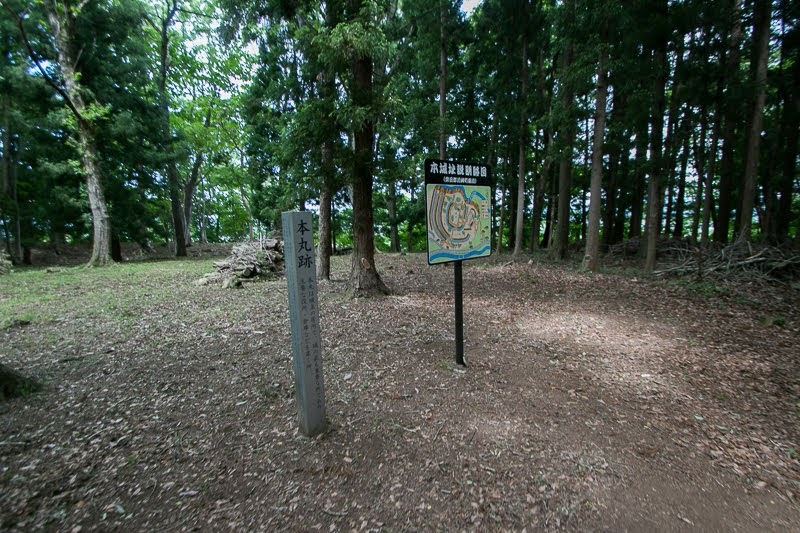 In 1588, Yoshiaki Mogami allied with Osaki clan then encircled Date clan lead by Masamune Date (1567-1636), the son of Terumune. Inferior Date army made peace with Yoshiaki Mogami under coordination of Princess Yoshihime, and Masamune barely escaped dangerous situation soon broke Ashina clan then became the ruler of south part of Tohoku region. 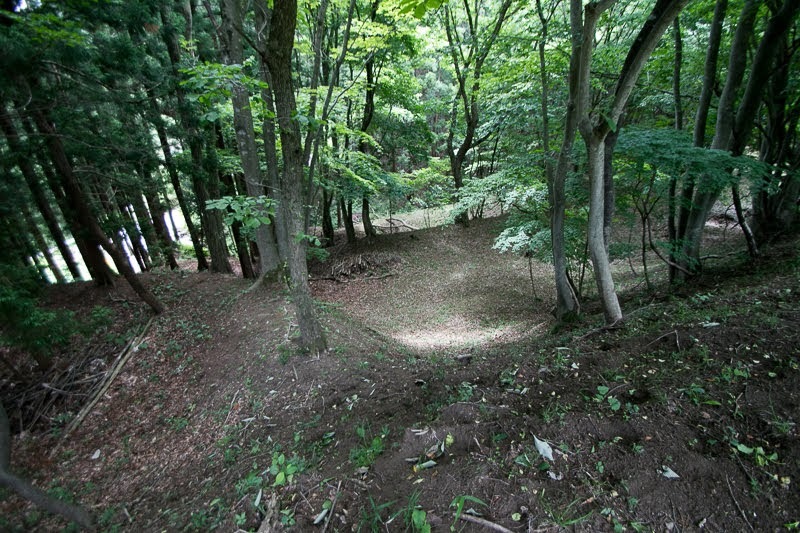 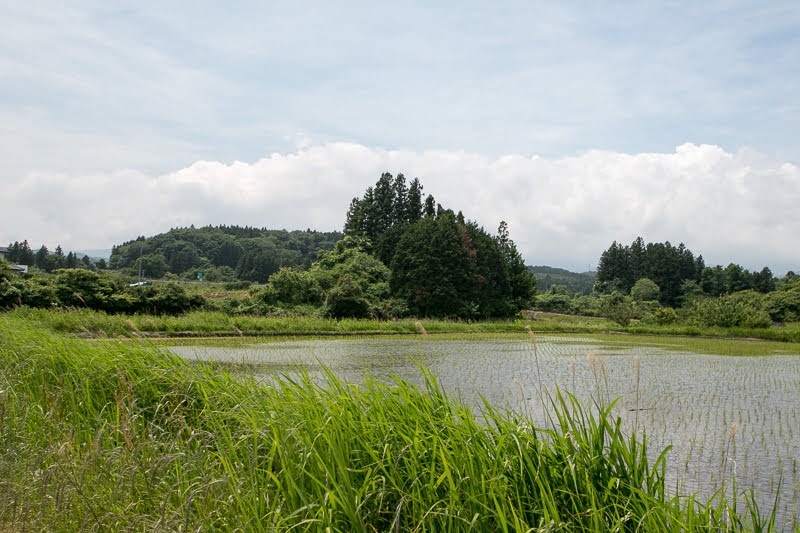 But Date clan also had to secure its border toward Yamagata basin, the main base of Mogami clan. 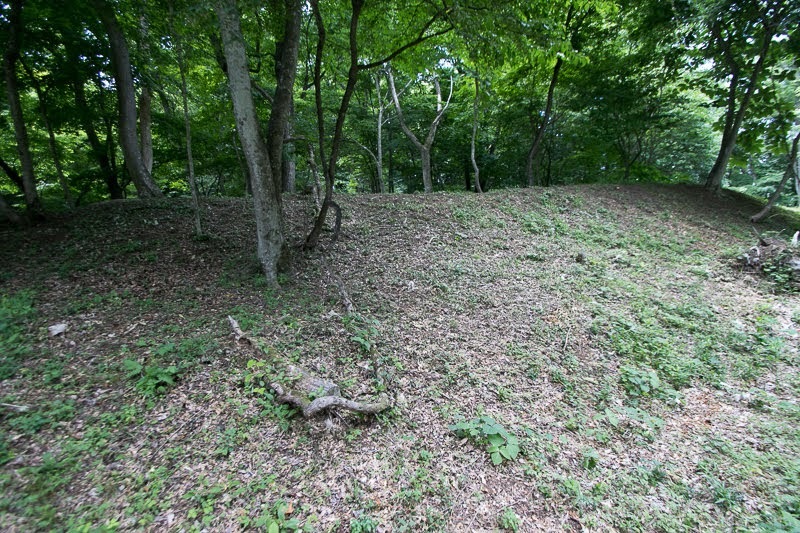 In 1575, Isago clan newly built Nakanouchi castle probably under the order of Date clan as a border castle toward Sasaya-Toge pass. 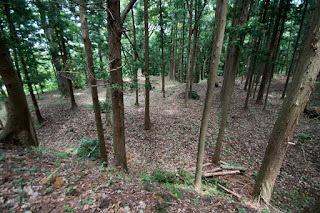 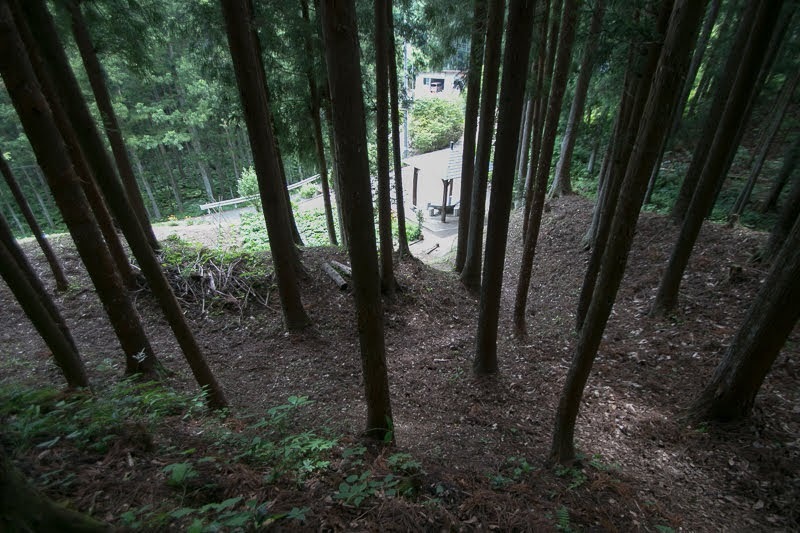 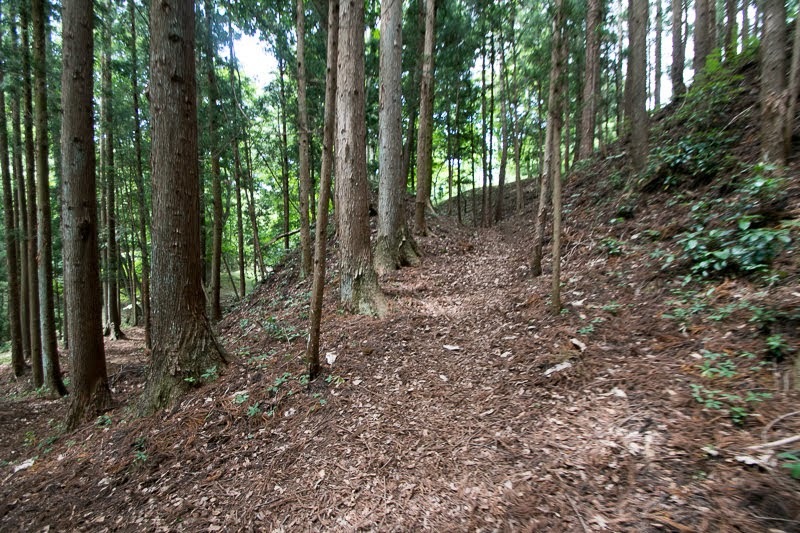 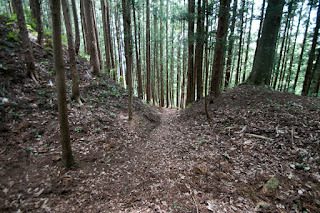 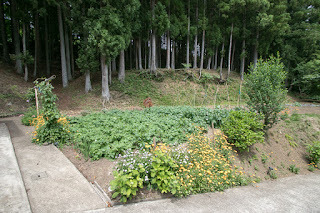 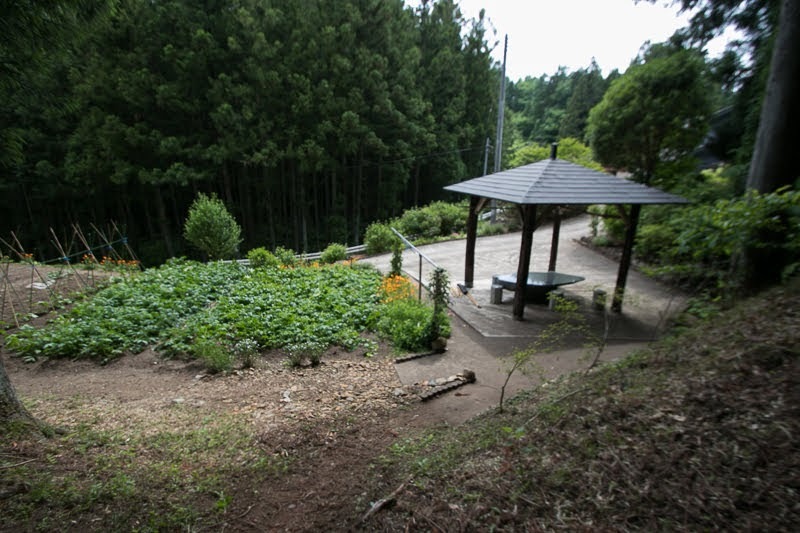 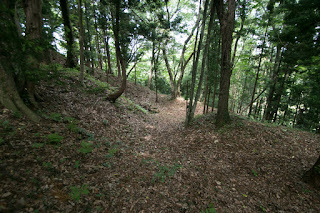 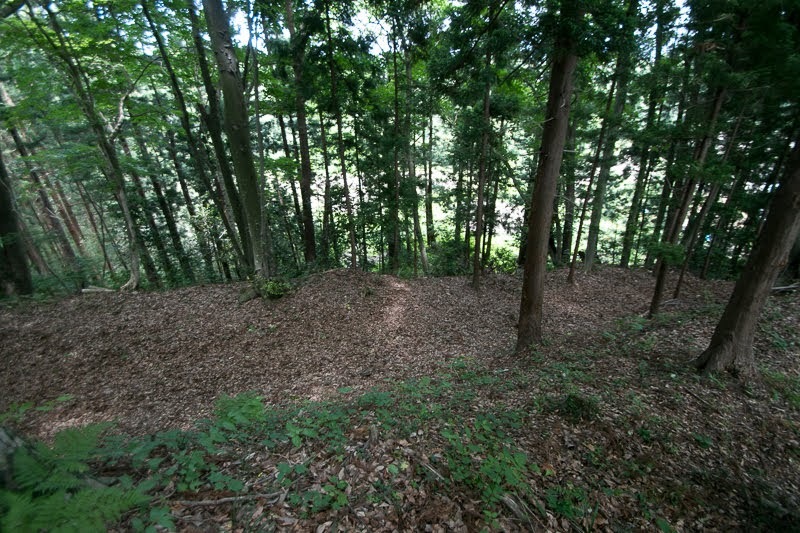 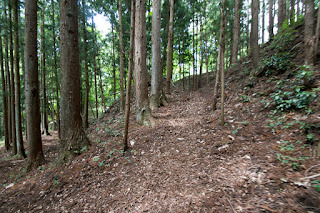 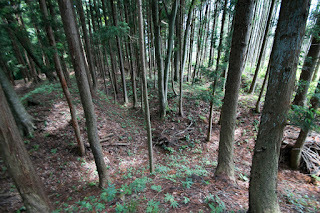 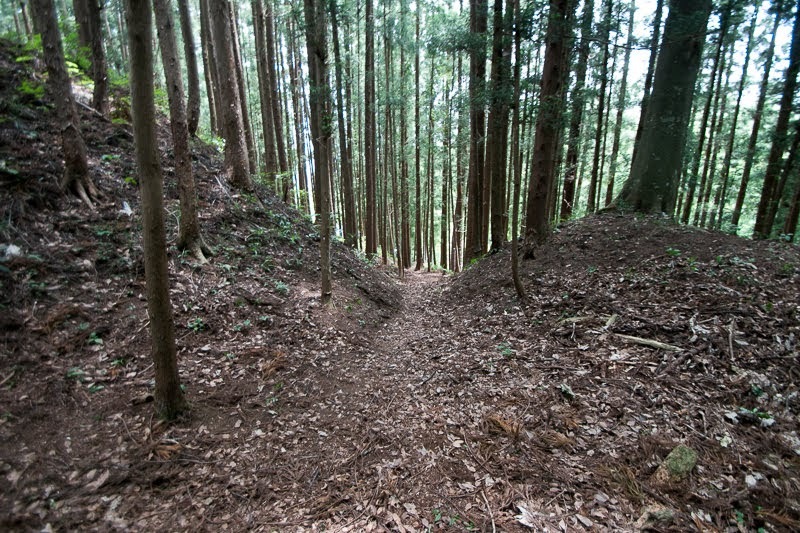 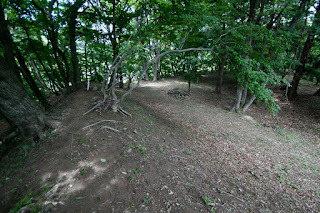 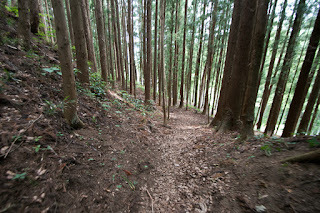 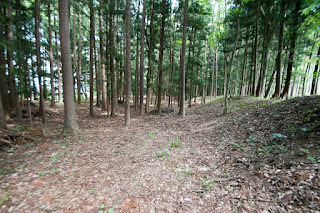 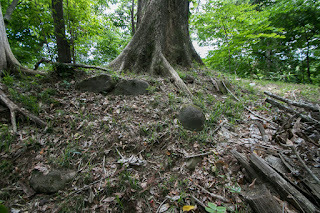 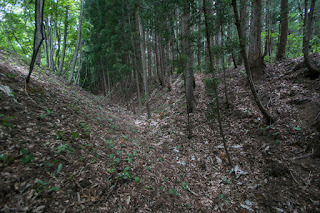 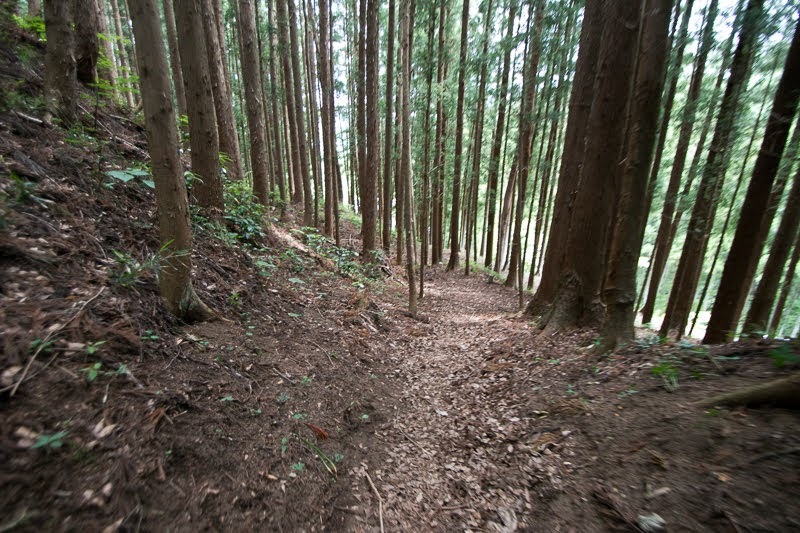 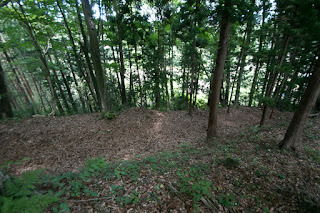 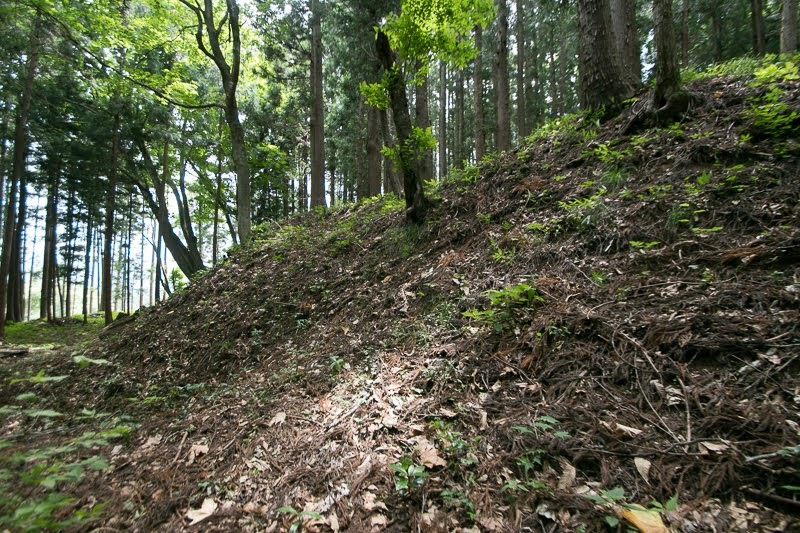 At that time Sasaya Kaido road passed along small height at the north hillside of the castle, it was a suitable place to manage the communication of the road and block in case of emergency. 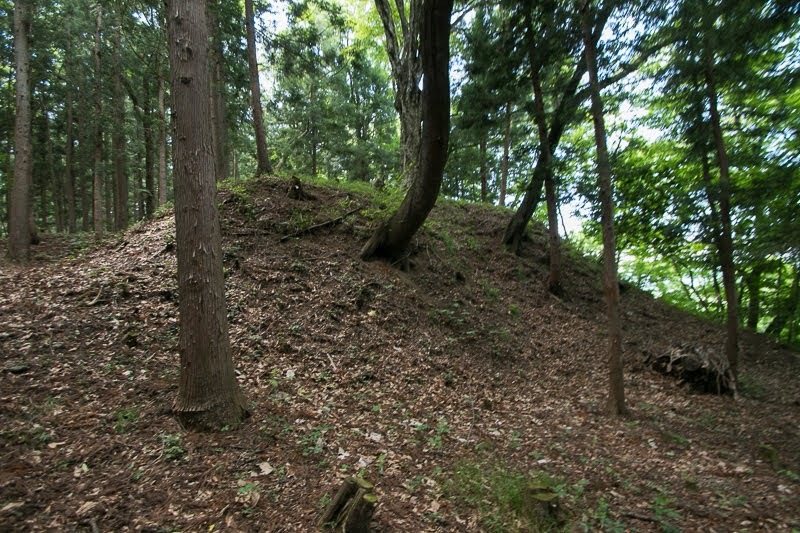 Different from other castles of Date clan, the structure of Nakanouchi castle is well planned and constructed with a lot of labor like the castles of central lords. 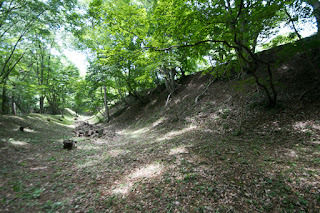 Central area of the castle is a rectangular shaped one of about 100 meter long and 50 meter wide, with straight line of clay walls and dry moats. 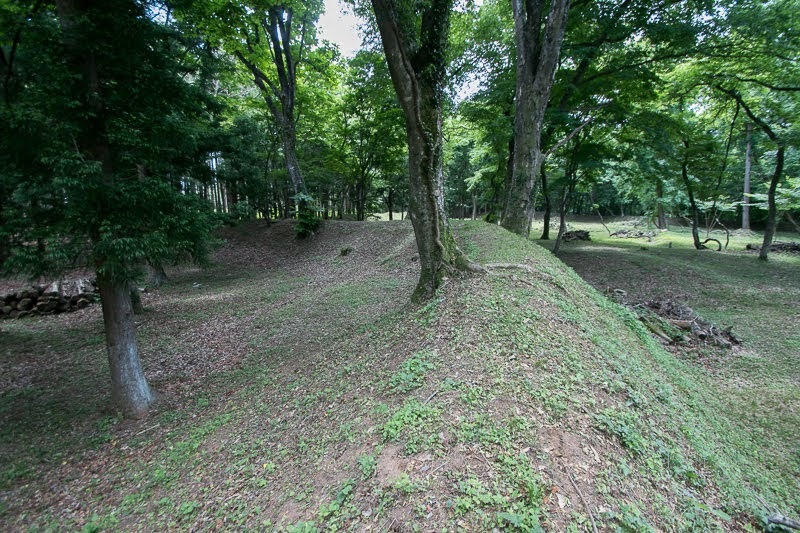 Southwestern line of central area faces the gentle scope at the edge of plateau, thus this part is securely protected by combination of Masugata style complex gate and Umadashi style buffer area. 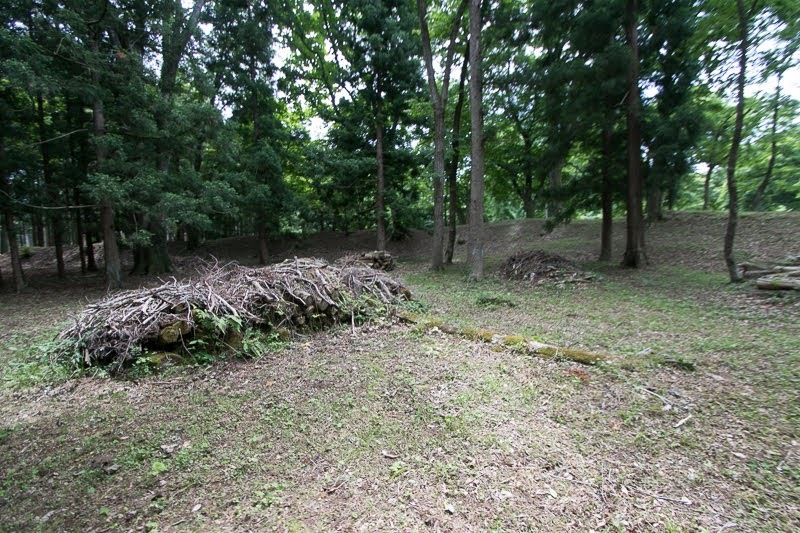 This Masugata gate is protected by stone walls, and surely equivalent to the castles of central area lords not seen in other castles of Date clan at the same period. Outer area is a parallelogram shaped one of about 400 meter long and 150 meter wide, cover the western part of central area where directly connected to the outer part of plateau. 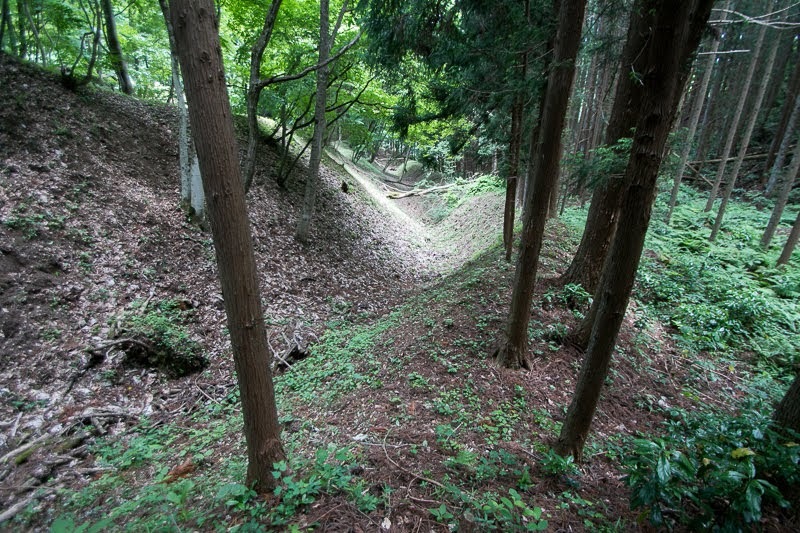 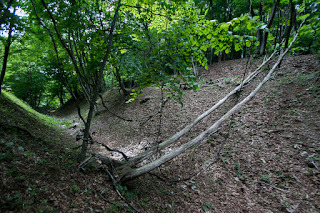 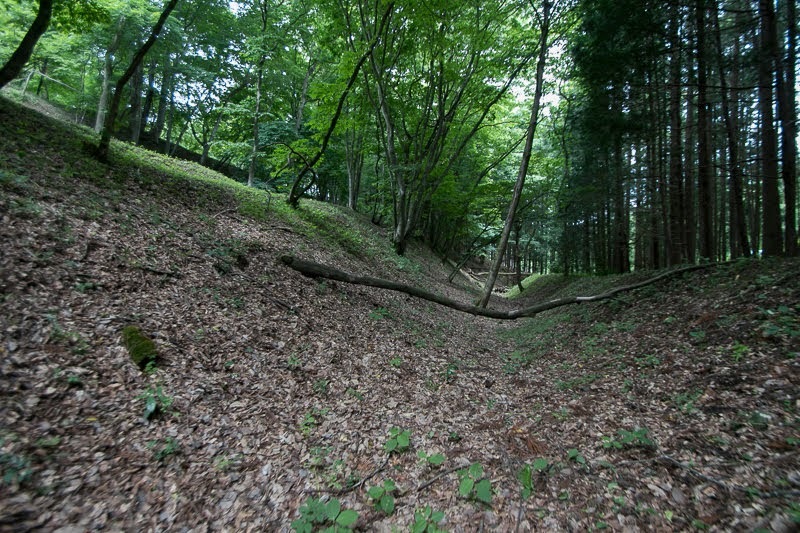 As this part is an expected approach line of enemy, this part is securely protected by two lines of dry moats and three lines of clay walls. 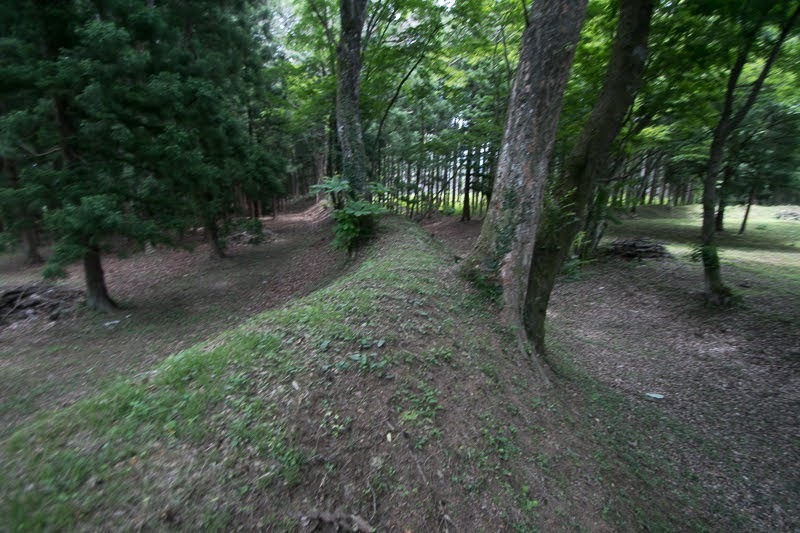 These structures enables to stuck enemies and fire of matchlock guns from inside of the castle. 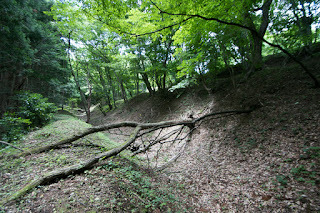 Backside gate of the castle is built just at the next of the root of plateau, but this gate is also securely protected by gated with folded road and buffer area. 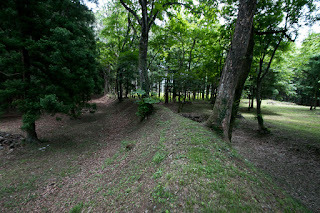 Total size of the castle is about 300 meter long and 200 meter wide, and has high degree of completion compared with other branch castles of Date clan even remained at Edo era. 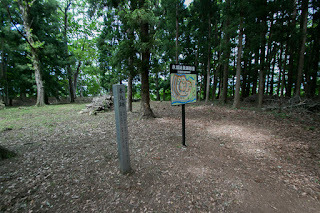 10 years after the unification of Japan by central ruler Hideyoshi Toyotomi (1537-1598), Tohoku region fell into the conflict between Uesugi clan, and alliance of Date clan and Mogami clan correlating to the conflict at central area between Ieyasu Tokugawa (1543-1616) and Mitsunari Ishida (1560-1600). This time Date clan and Mogami clan stood at same side, but there might be a fear that Uesugi clan which was stronger than sum of Date clan and Mogami clan at first attack Mogami clan then turn their army to Date clan from Yamagata basin. 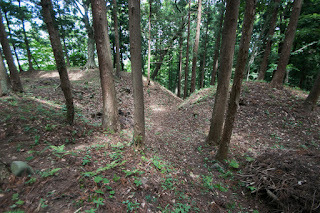 To support Mogami clan and protect themselves, Date clan might strengthened Nakanouchi castle at this time. As a result, Yoshiaki Mogami stood against fierce attack of Uesugi army by the victory of Ieyasu Tokugawa at the main battle of Sekigahara in 1600, and the attack from Yamagata basin did not realize. 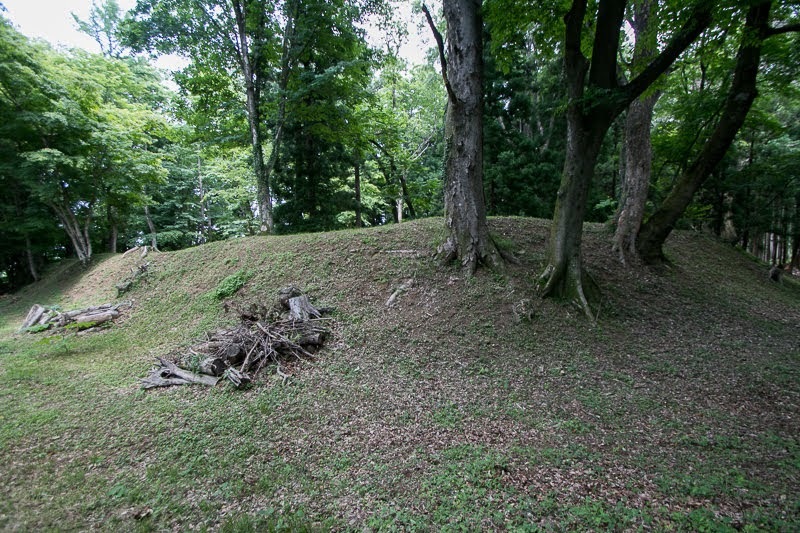 In 1608, Isago clan newly built Kawasaki castle at neighbor hill at the center of flat area, considering the convenience and room to build a town, and Nakanouchi castle was abolished at this time. 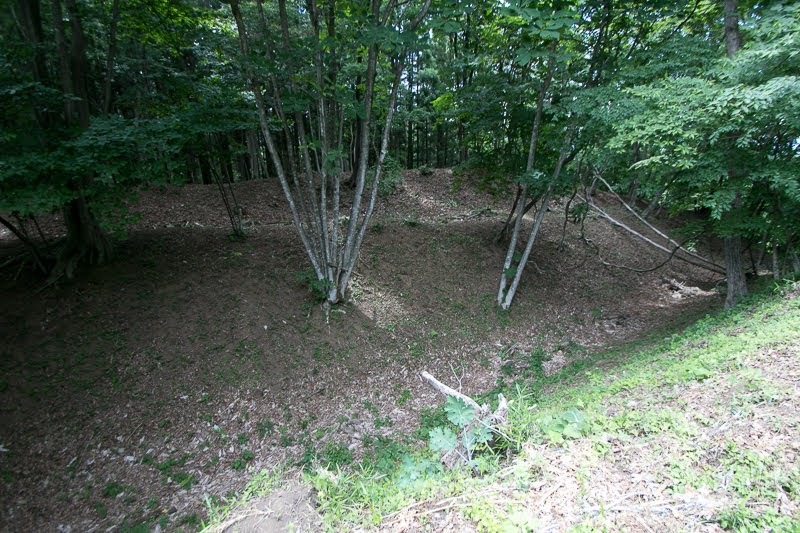 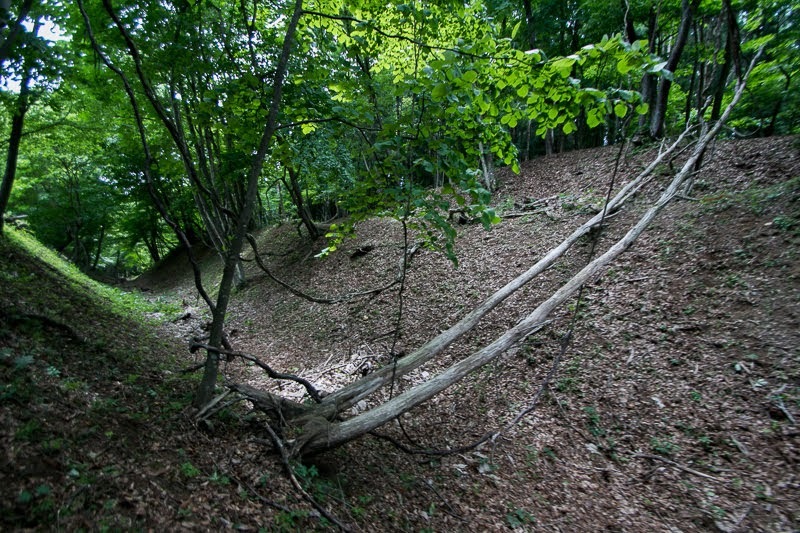 Today no building is left but structure of the castle well remain over the hill. Well planned and built structure of the castle unlike the traditional way of Date clan well shows the knowledge and experience of Date clan achieved during the long battle and communication with central lords. 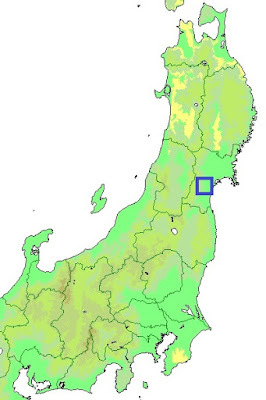 This also shows the tension of border area which enables direct access to the center of Sendai area. 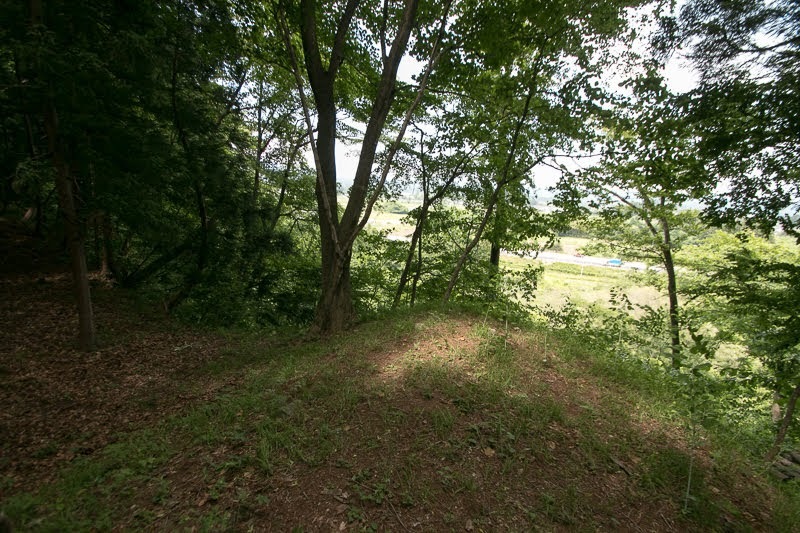 15 minutes drive from Yamagata Jidoshado Expressway Kawasaki interchange.